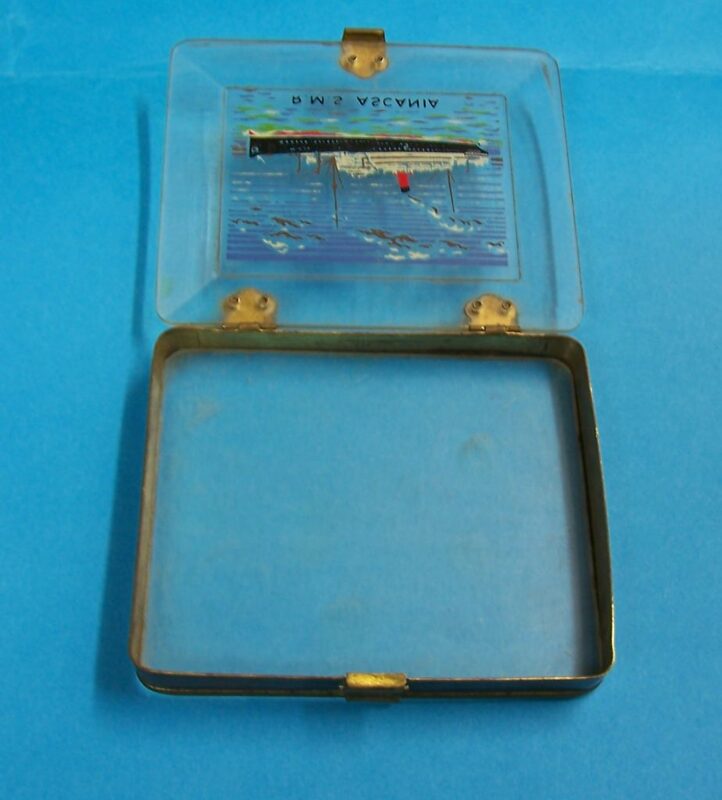 Cunard RMS Ausonia silver plated table cigarette box dating from the 1920’s, with the ship’s name engraved to the front. 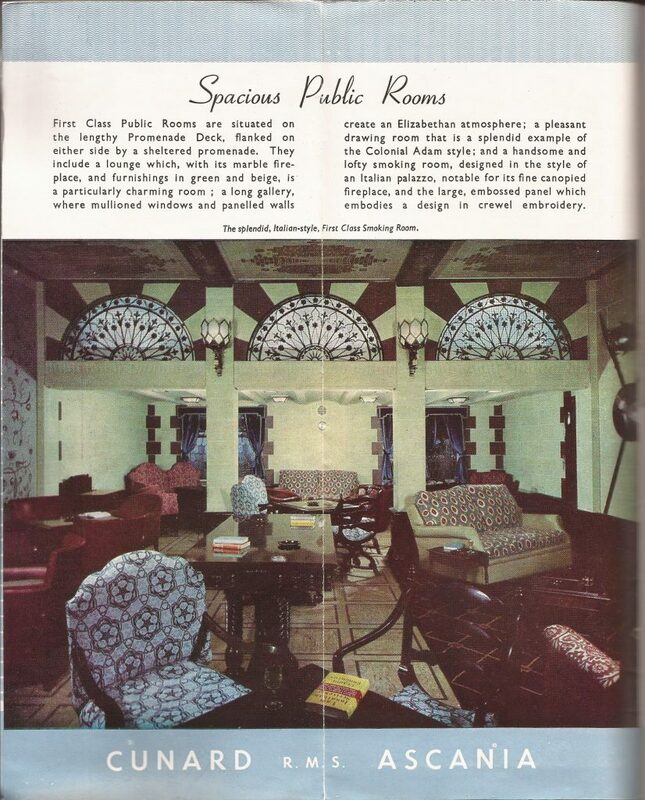 The enamel decoration on the lid would have matched the fabric of the First Class Smoking Room chairs and sofas. 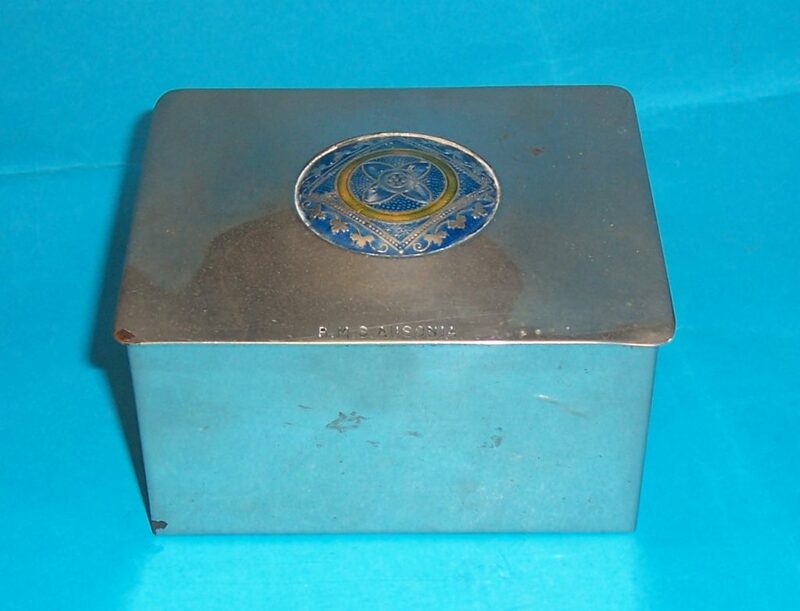 Identical to the RMS Ausonia table cigarette box, a RMS Andaina silver plated table cigarette box dating from the 1920’s, with the ship’s name engraved to the front. 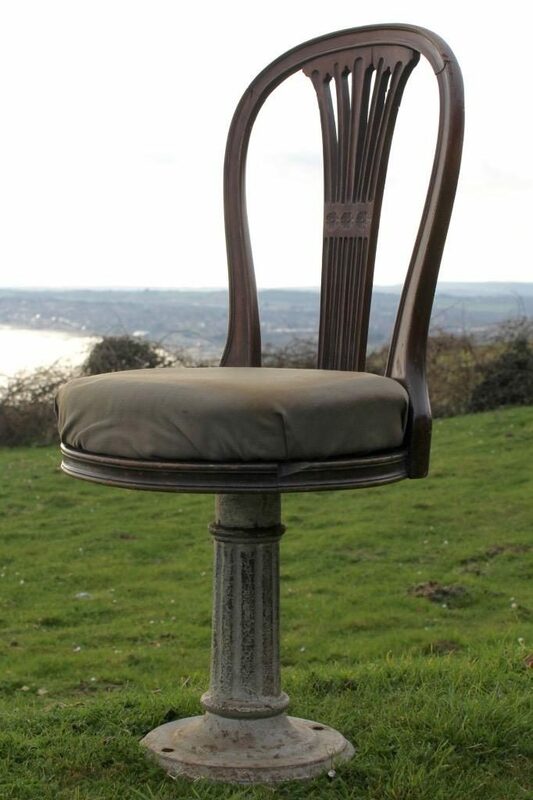 The enamel decoration on the lid would have matched the fabric of the First Class Smoking Room chairs and sofas. 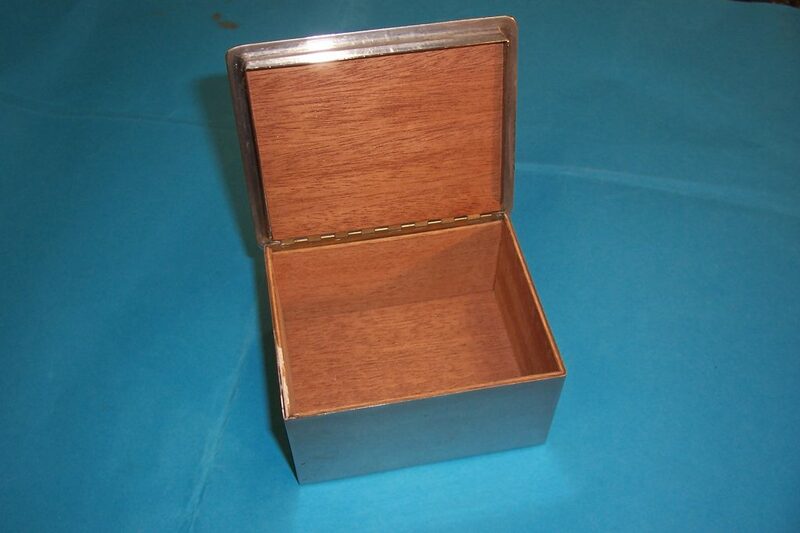 The interior of the cigarette box is lined with cedar wood. 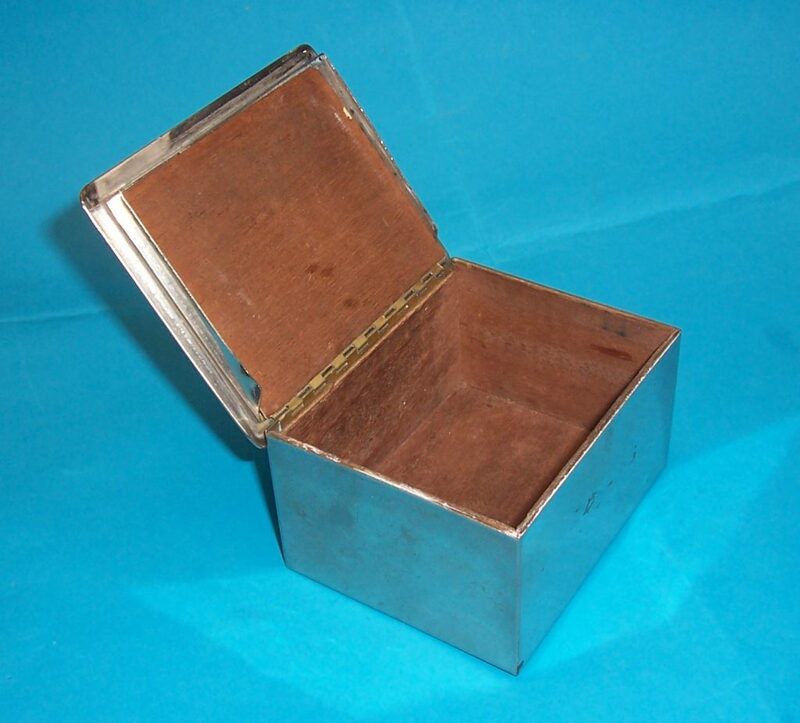 Silver plated sugar sifter from RMS Ascania dating from the 1920’s, with the ship’s name engraved to the front. 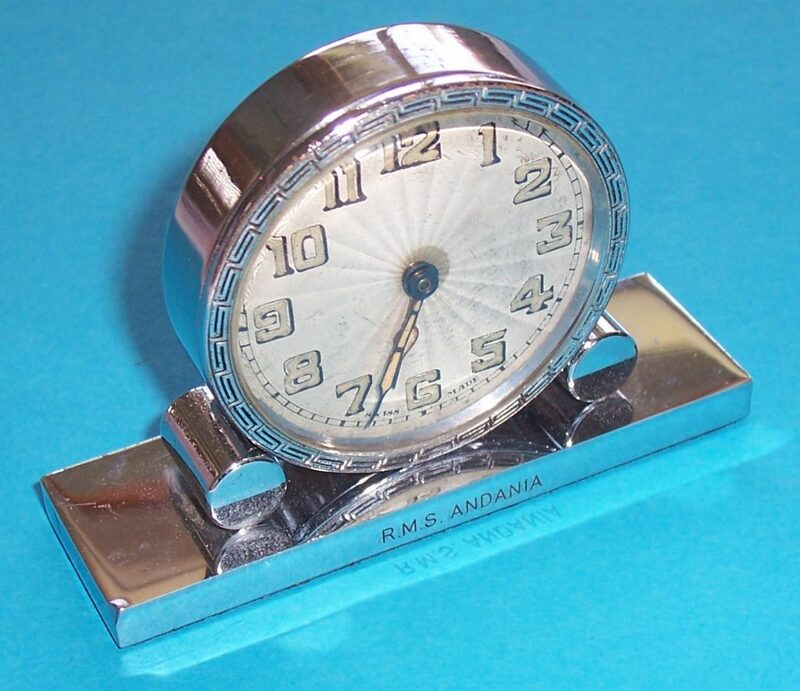 Silver plated travel clock from RMS Andania dating from the 1920’s, with the ship’s name engraved to the front. 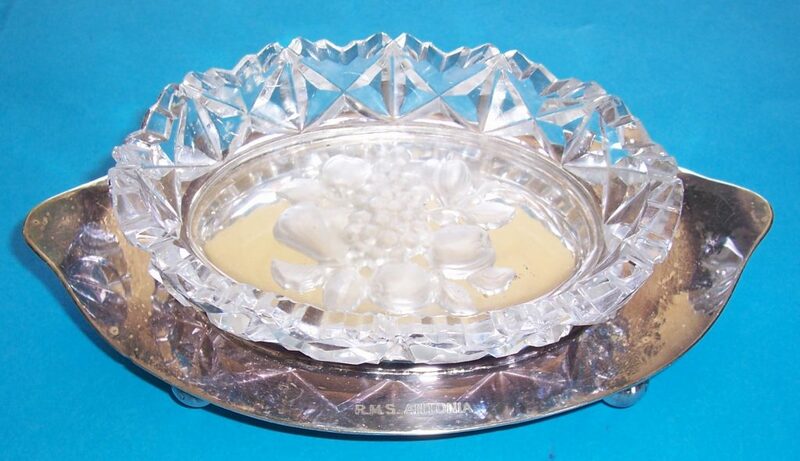 Silver plated glass relish dish with silver plated server from RMS Antonia dating from the 1920’s, with the ship’s name engraved to the front. 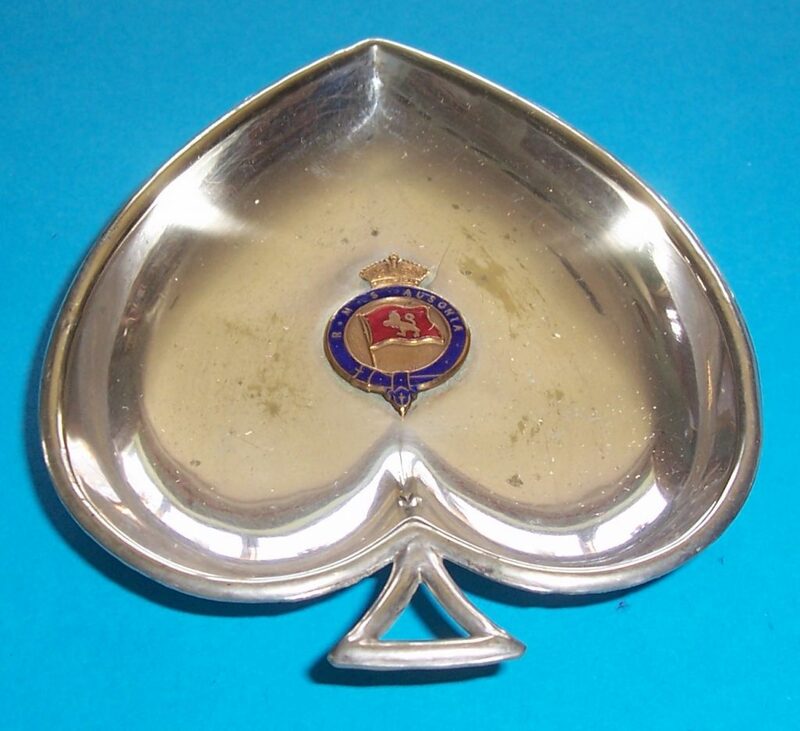 A RMS Ausonia silver plated spade shaped nut dish decorated with an enamelled belt buckle design badge. 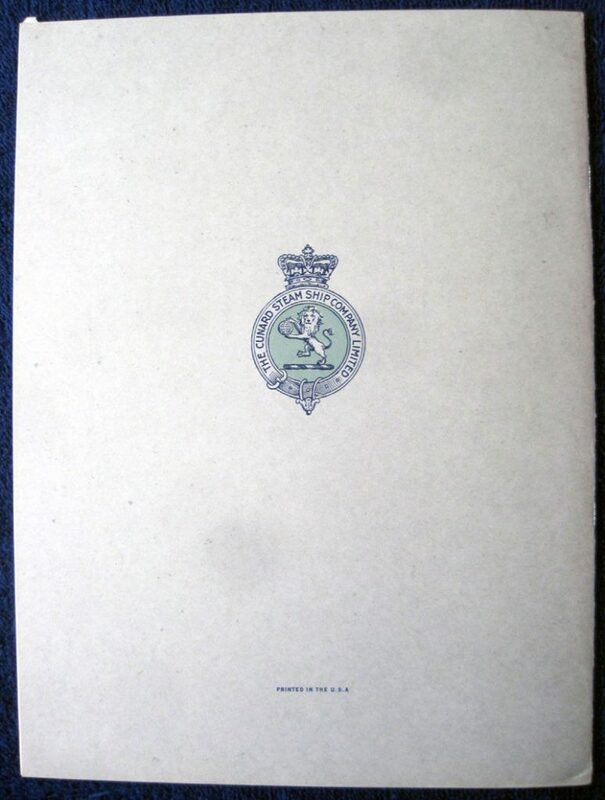 In the centre of the badge is the red Cunard flag bearing a gold lion surrounded by a blue enamelled garter inscribed RMS Ausonia. Above the garter is a flat topped crown and the whole enamel is surrounded by a laurel wreath. 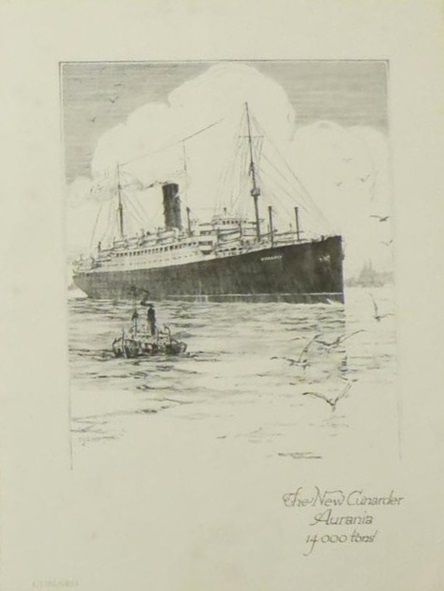 The Cunard flag indicates that this was before the merger with the White Star Line in 1934. 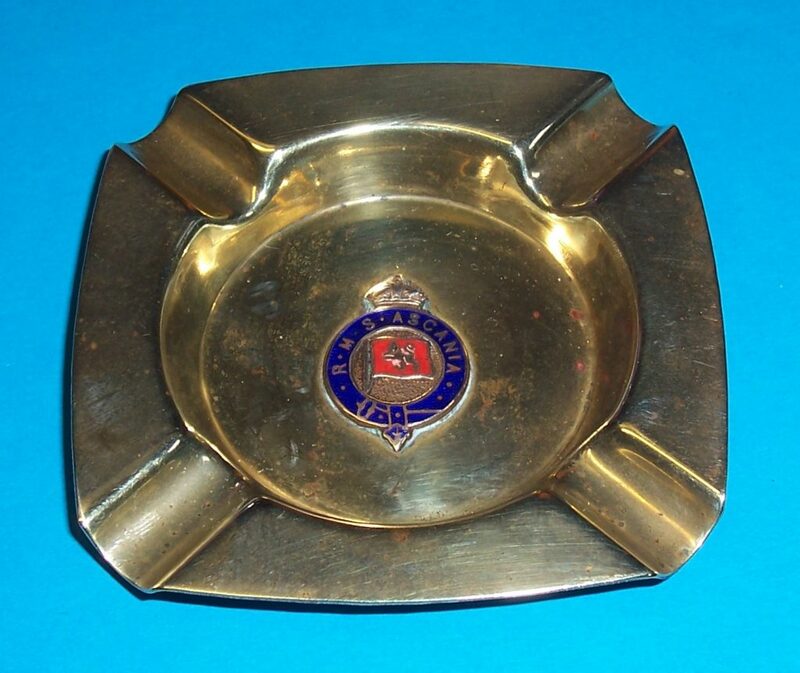 A RMS Ausonia silver plated bonbon dish decorated with an enamelled belt buckle design badge. In the centre of the badge is the red Cunard flag bearing a gold lion surrounded by a blue enamelled garter inscribed RMS Ausonia. Above the garter is a flat topped crown and the whole enamel is surrounded by a laurel wreath. 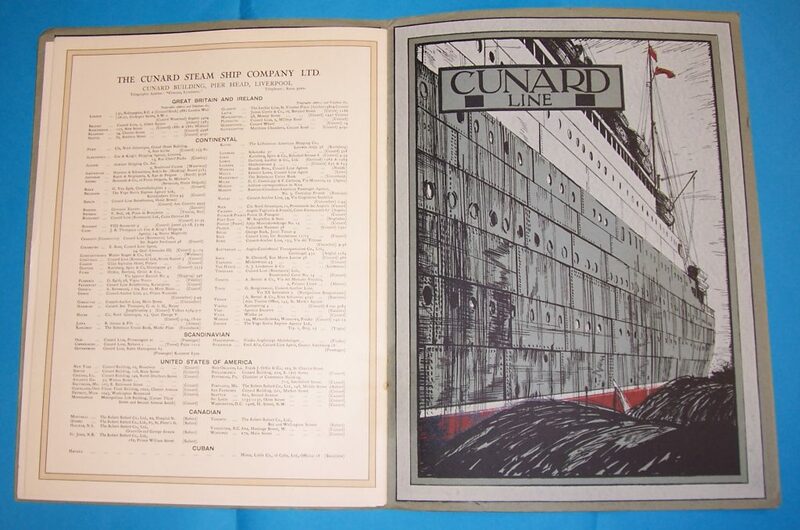 The Cunard flag indicates that this was before the merger with the White Star Line in 1934. A RMS Alaunia silver plated tea spoon with a tear drop shaped bowel and twisted handle, with the head of the spoon decorated with an enamelled belt buckle design badge. In the centre of the badge is the red Cunard flag bearing a gold lion surrounded by a blue enamelled garter inscribed RMS Alaunia. Above the garter is a flat topped crown and the whole enamel is surrounded by a laurel wreath. 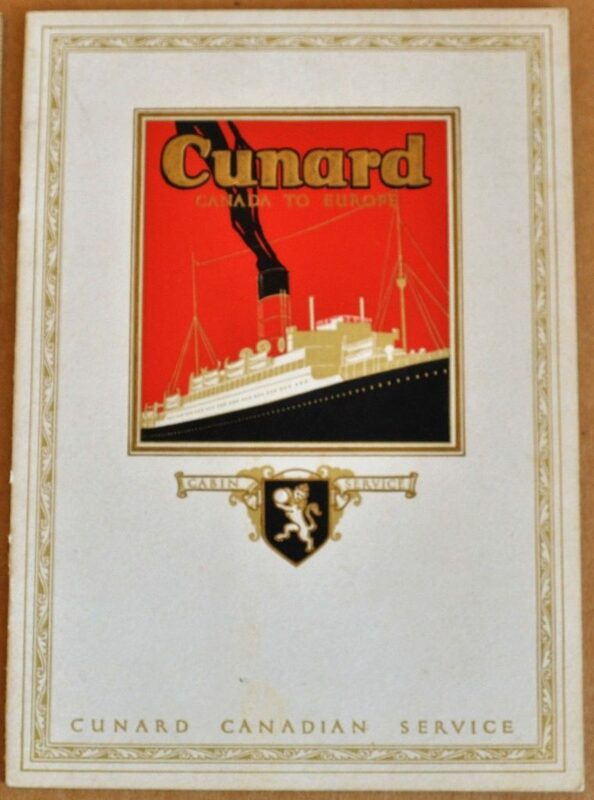 The Cunard flag indicates that this was before the merger with the White Star Line in 1934. 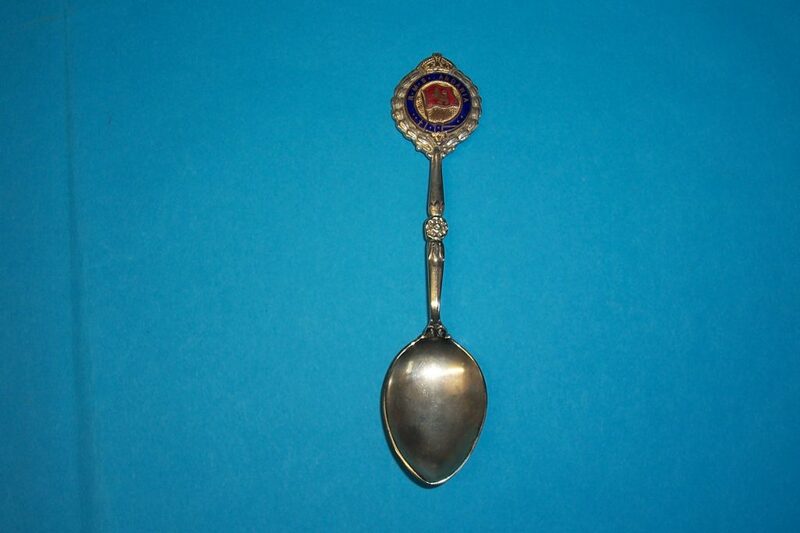 A RMS Aurania silver plated tea spoon with a tear drop shaped bowel and twisted handle, with the head of the spoon decorated with an enamelled belt buckle design badge. 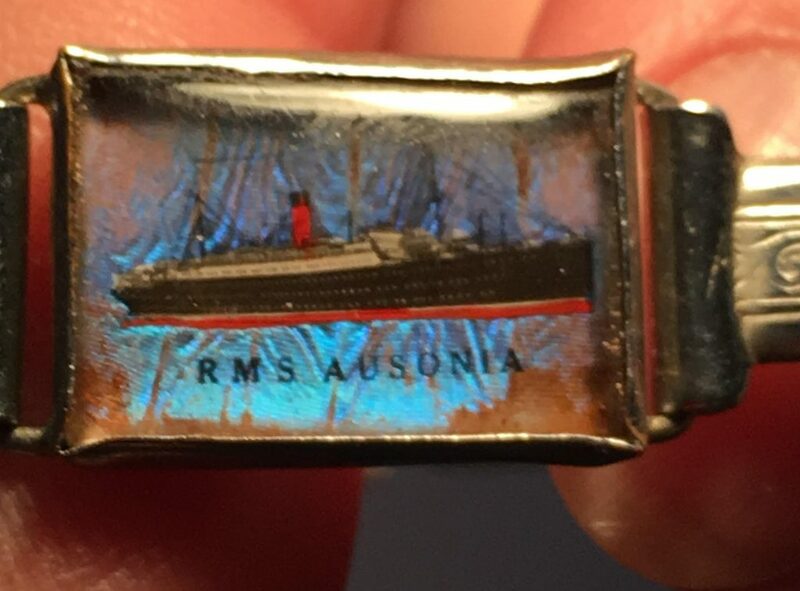 In the centre of the badge is the red Cunard flag bearing a gold lion surrounded by a blue enamelled garter inscribed RMS Aurania. Above the garter is a flat topped crown and the whole enamel is surrounded by a laurel wreath. 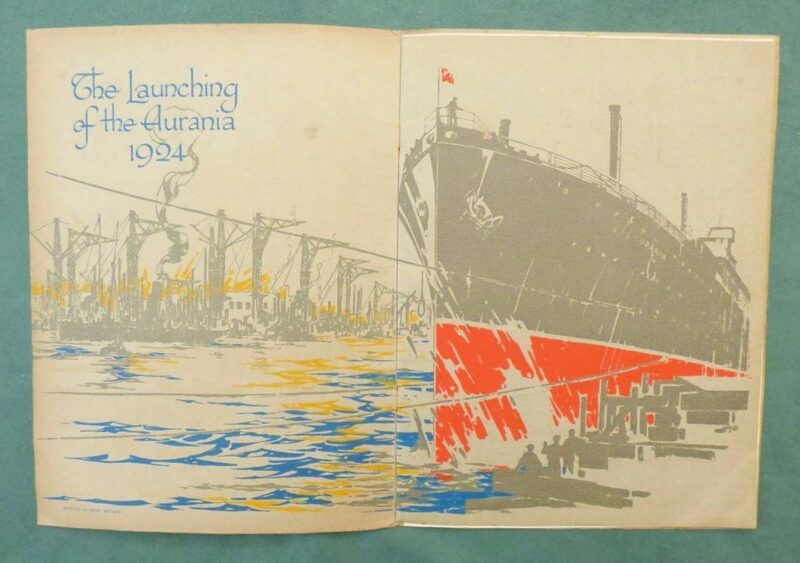 The Cunard flag indicates that this was before the merger with the White Star Line in 1934. 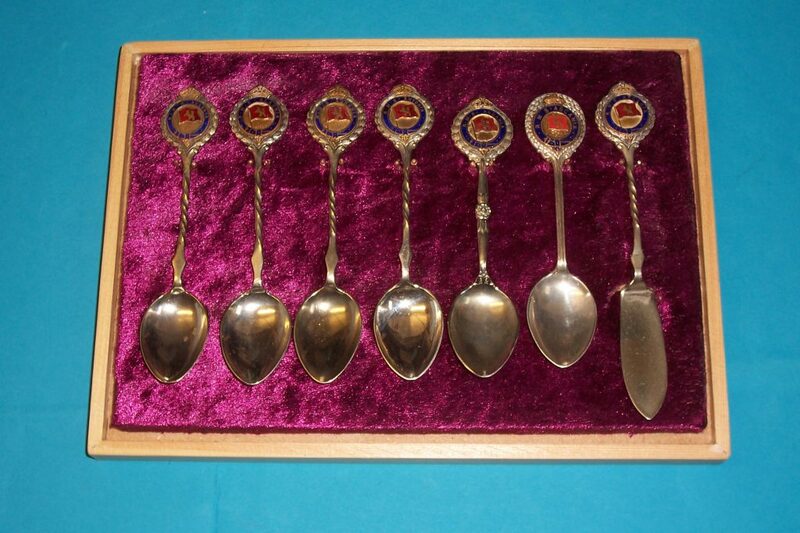 A RMS Ausonia silver plated tea spoon with a tear drop shaped bowel and twisted handle, with the head of the spoon decorated with an enamelled belt buckle design badge. 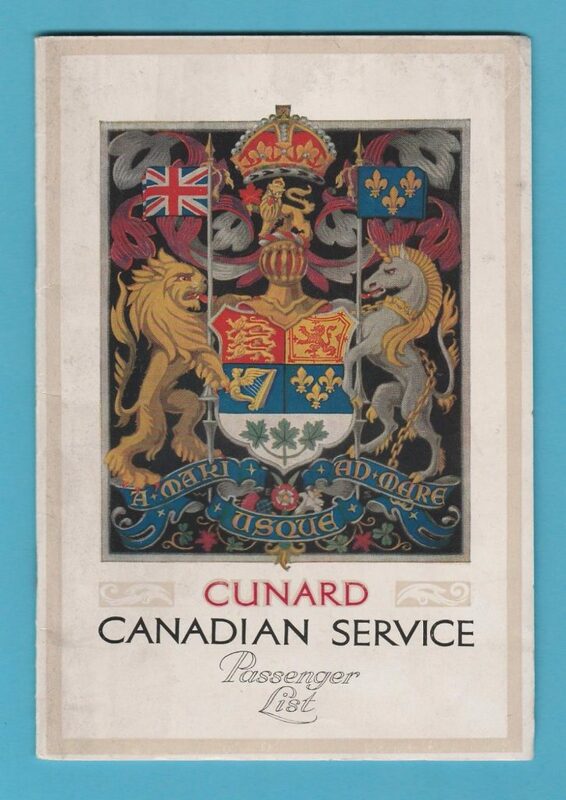 In the centre of the badge is the red Cunard flag bearing a gold lion surrounded by a blue enamelled garter inscribed RMS Ausonia. Above the garter is a flat topped crown and the whole enamel is surrounded by a laurel wreath. 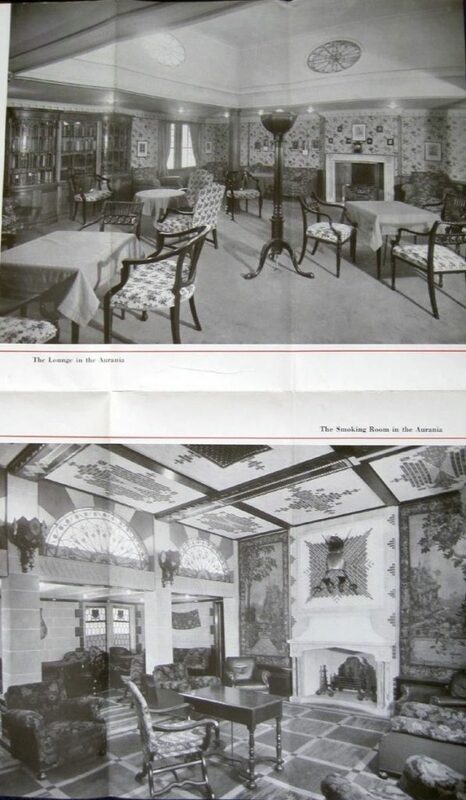 The Cunard flag indicates that this was before the merger with the White Star Line in 1934. A RMS Antonia silver plated tea spoon with a tear drop shaped bowel and twisted handle, with the head of the spoon decorated with an enamelled belt buckle design badge. In the centre of the badge is the red Cunard flag bearing a gold lion surrounded by a blue enamelled garter inscribed RMS Antonia. Above the garter is a flat topped crown and the whole enamel is surrounded by a laurel wreath. 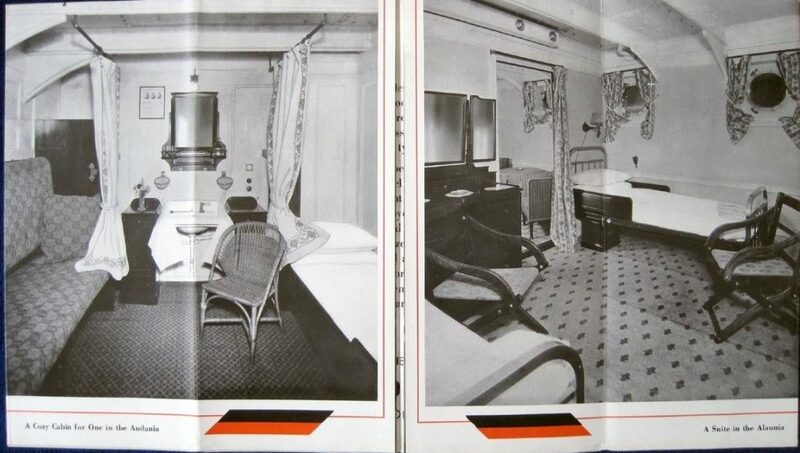 The Cunard flag indicates that this was before the merger with the White Star Line in 1934. 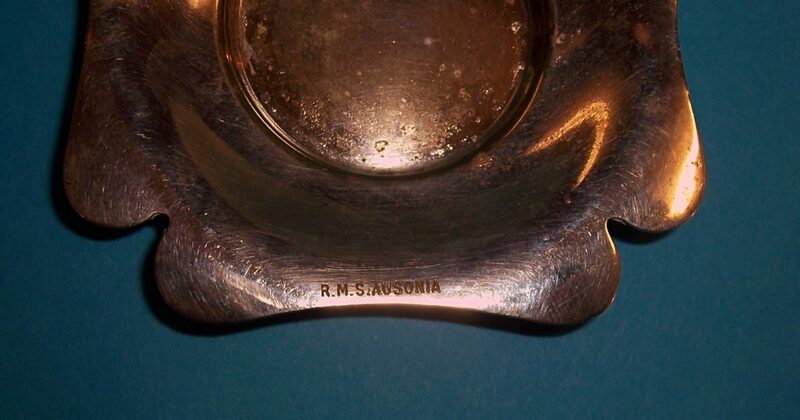 A RMS Ascania silver plated tea spoon with a tear drop shaped bowel and plain handle, with the head of the spoon decorated with an enamelled belt buckle design badge. In the centre of the badge is the red Cunard flag bearing a gold lion surrounded by a blue enamelled garter inscribed RMS Ascania. Above the garter is a flat topped crown and the whole enamel is surrounded by a laurel wreath. 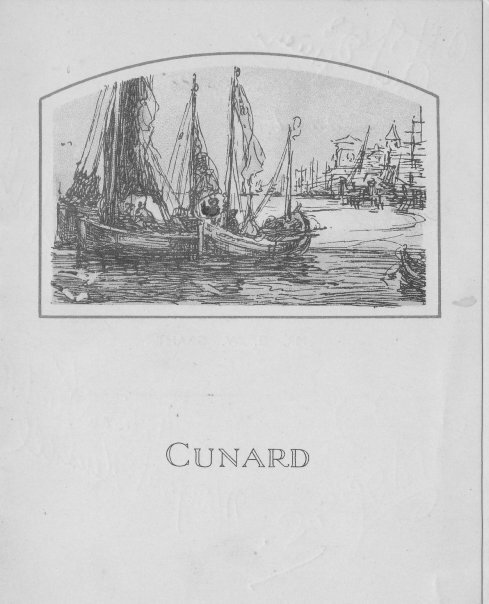 The Cunard flag indicates that this was before the merger with the White Star Line in 1934. My Cunard ‘A’ Class tea spoon collection in their presentation box, along with a fish knife from RMS Ascania also dating from the 1920’s. A RMS Andania silver plated tea spoon with a tear drop shaped bowel and flat handle featuring a rose, with the head of the spoon decorated with an enamelled belt buckle design badge. In the centre of the badge is the red Cunard flag bearing a gold lion surrounded by a blue enamelled garter inscribed RMS Andania. Above the garter is a flat topped crown and the whole enamel is surrounded by a laurel wreath. 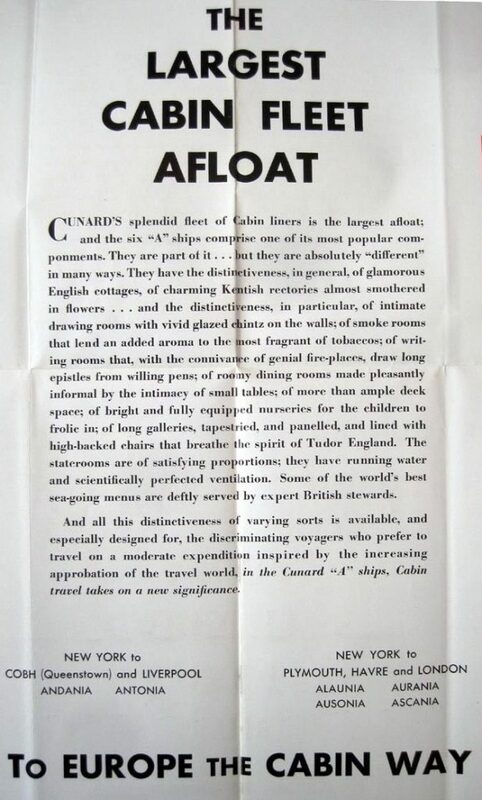 The Cunard flag indicates that this was before the merger with the White Star Line in 1934. 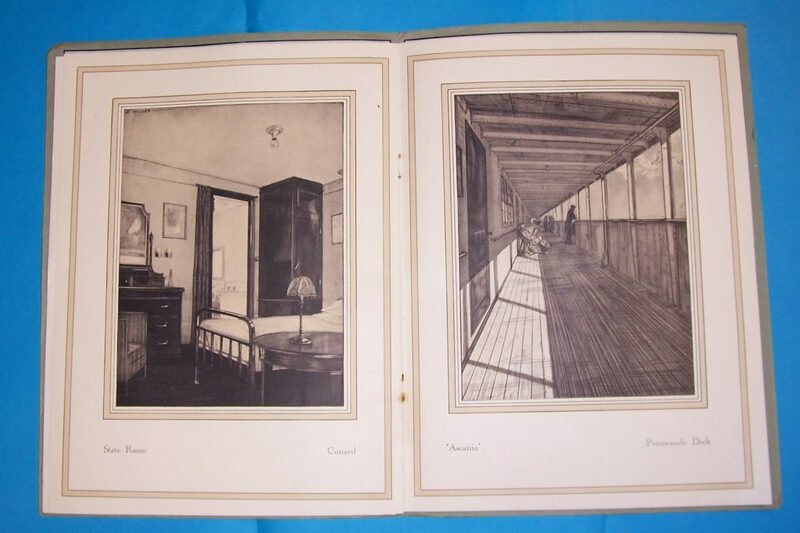 In April 2010 at Bonhams Auction House in New York, USA, a significant private American collection of Maritime paintings, ephemera and models was sold. 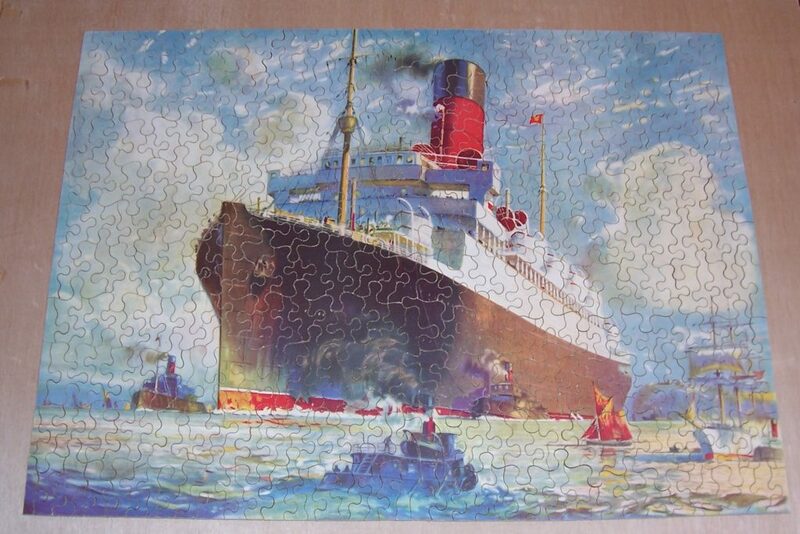 A notable model within the sale was the rare ship cut-away model of the R.M.S. 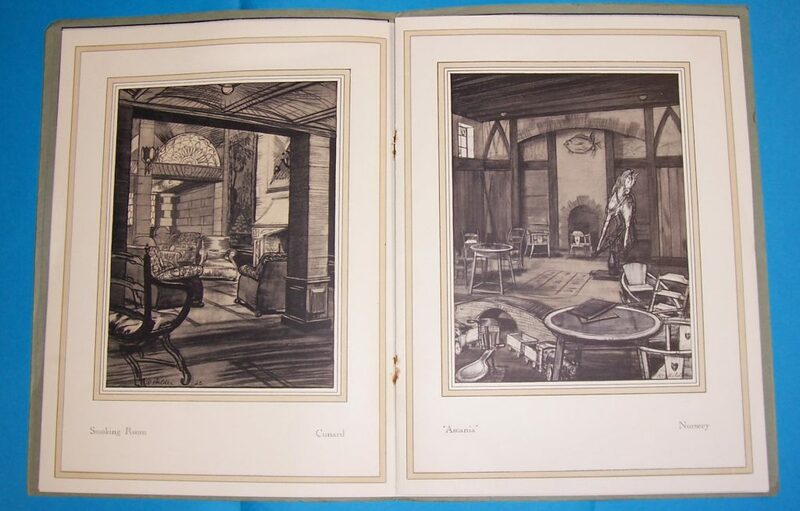 Ascania (circa 1925). 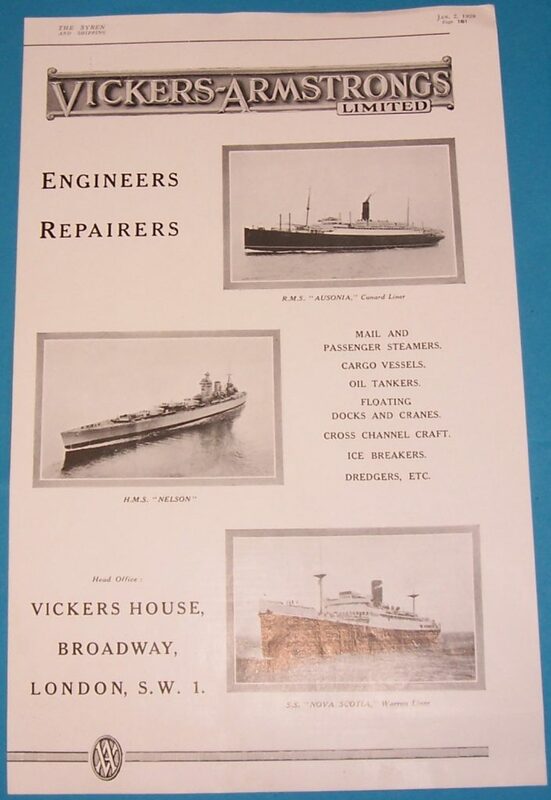 Built to a scale of 1/10 inch = 1 ft, the starboard side was finished with a red bottom, white waterline, and black and white topsides with inset portholes, anchor, lowered gangway, rudder and brass propeller. 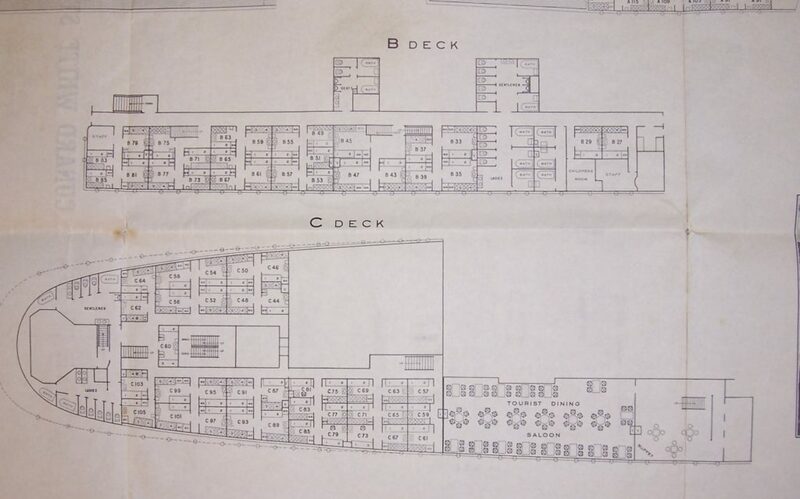 The port side of the model was cut-a-way and illustrated with the cross section of the ship (similar to the fold out deck plans popular for the period) showing from the keel to the deck the locations and rooms including: the food and supply stores, boiler room, engine room, crews quarters, 1st and 2nd class accommodations, grand staircase, dining rooms, lounges, men’s smoking room and women’s drawing room, captain’s and officers quarters, and numerous other areas of the ship meticulously laid out and detailed. 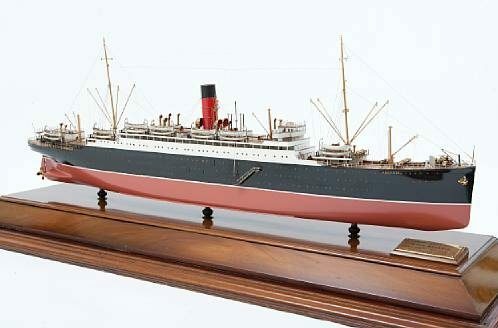 Displayed on three baluster turned German silver pedestals on a mahogany plinth within a mahogany framed glass case, the model sold for $122,000. 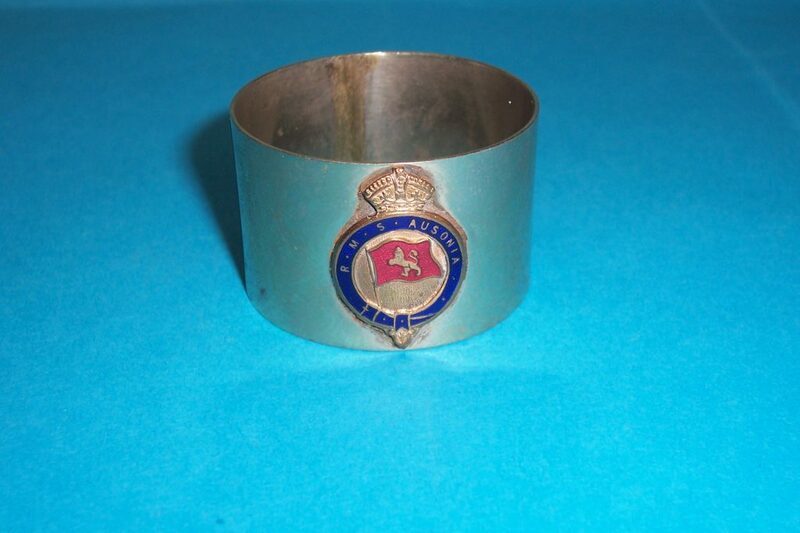 A RMS Ausonia silver plated napkin ring decorated with an enamelled belt buckle design badge. 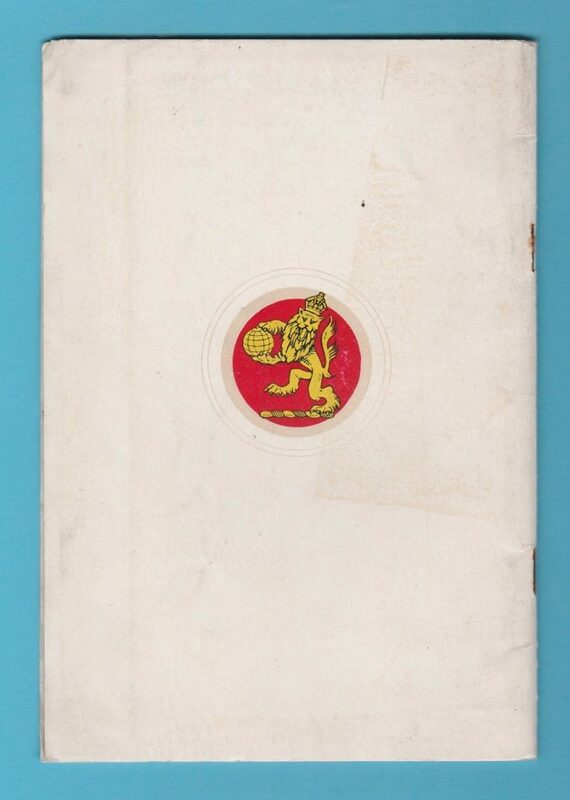 In the centre of the badge is the red Cunard flag bearing a gold lion surrounded by a blue enamelled garter inscribed RMS Ausonia. Above the garter is a flat topped crown and the whole enamel is surrounded by a laurel wreath. 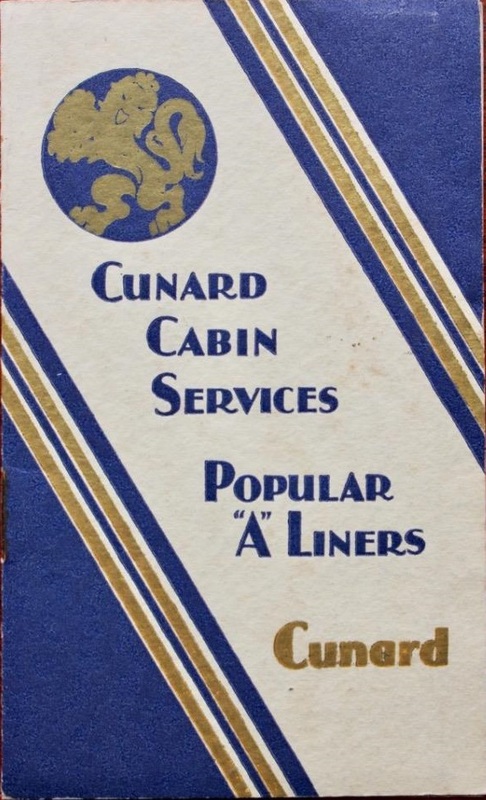 The Cunard flag indicates that this was before the merger with the White Star Line in 1934. 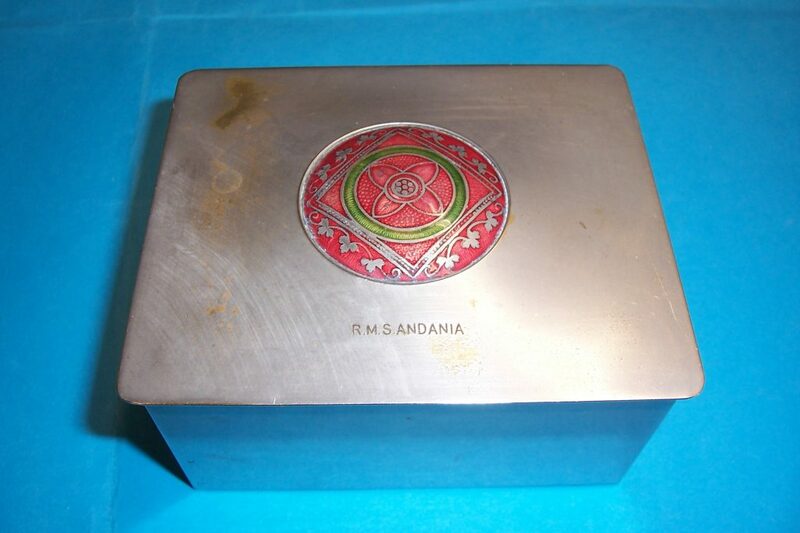 A RMS Ascania silver plated ash tray decorated with an enamelled belt buckle design badge. 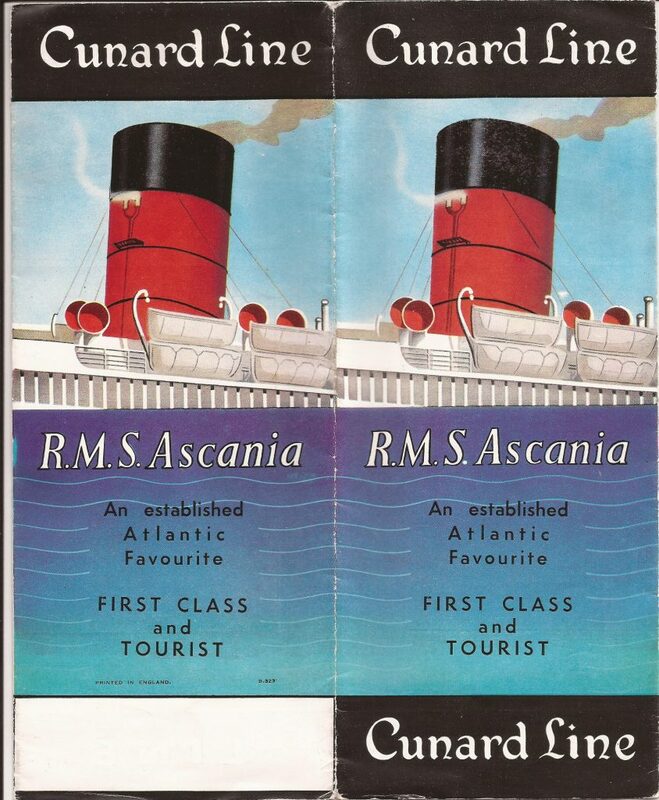 In the centre of the badge is the red Cunard flag bearing a gold lion surrounded by a blue enamelled garter inscribed RMS Ascania. Above the garter is a flat topped crown and the whole enamel is surrounded by a laurel wreath. 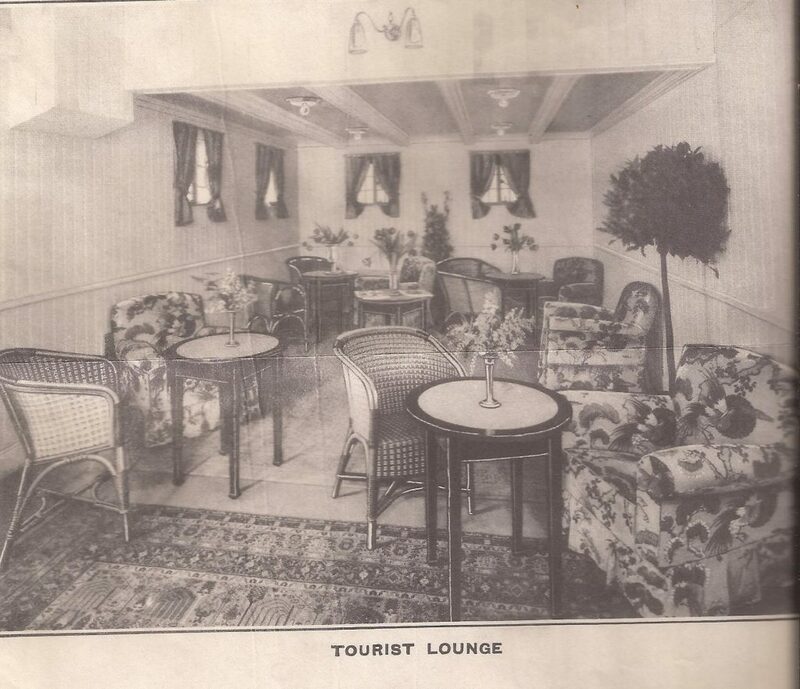 The Cunard flag indicates that this was before the merger with the White Star Line in 1934. 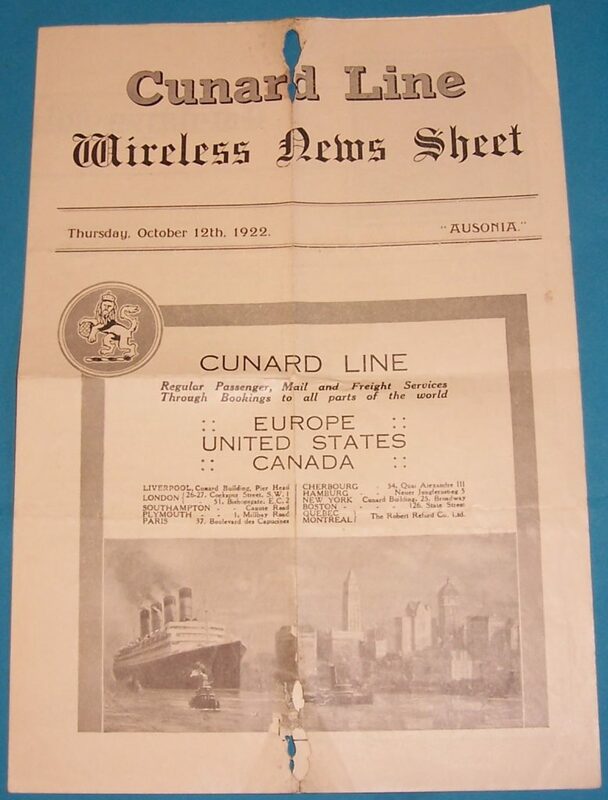 A rare Cunard Line wireless news sheet produced onboard the RMS Ausonia on the 12th October 1922. 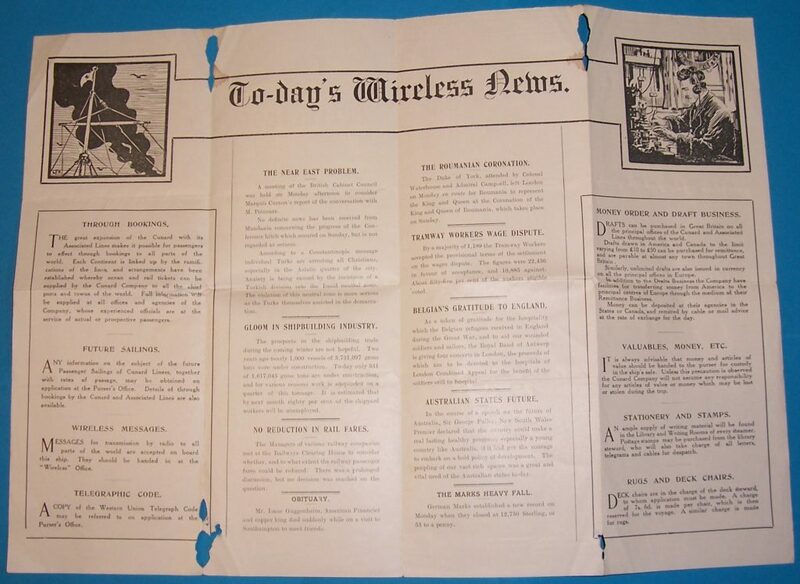 The news sheet is made up of four 10”x 7” sheets and was intended to give the ships passenger’s snippets of world news. 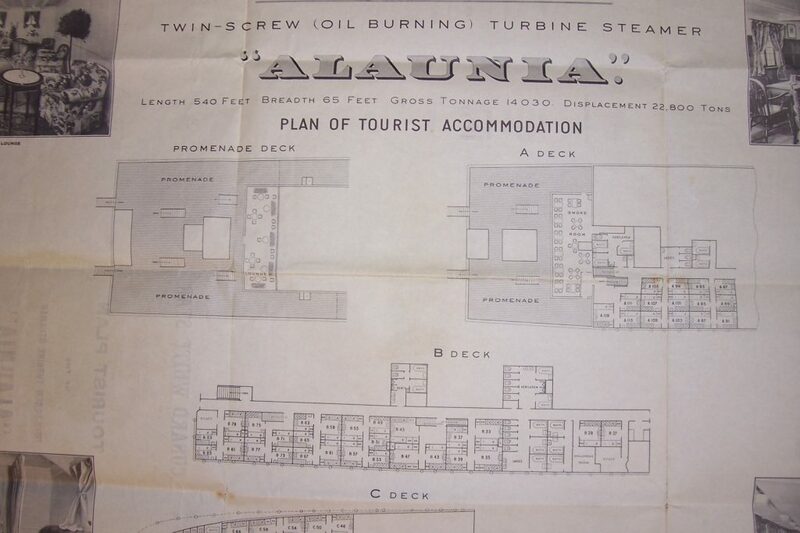 At the time that this news sheet was printed, RMS Ausonia was still a very new ship and had only been in service a mere six weeks. 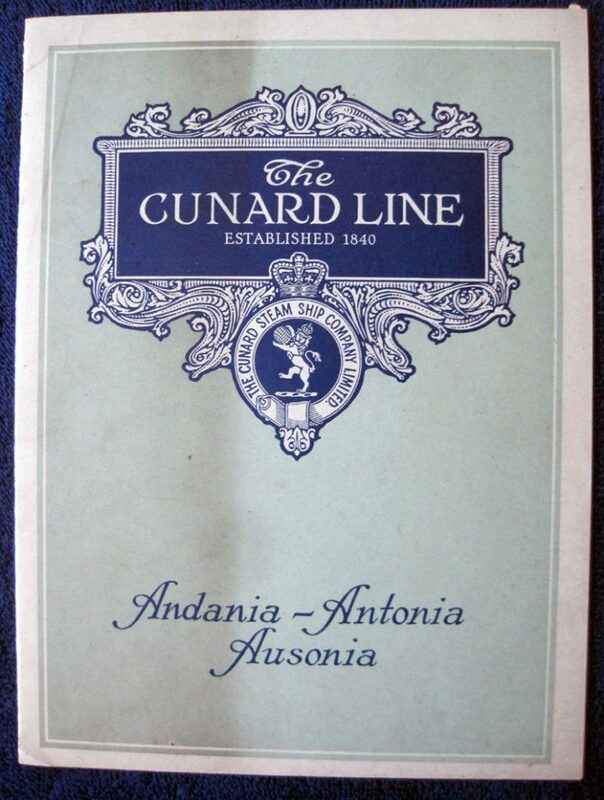 Receipt issued to Cunard Line from Armstrong Naval Yard in the amount of £21,469 as payment of 4th instalment of constructing the SS Ausonia liner. 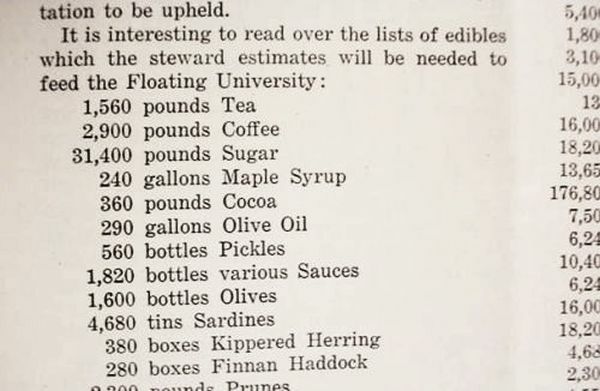 Dated 21st February 1920. One Penny tax stamp affixed. 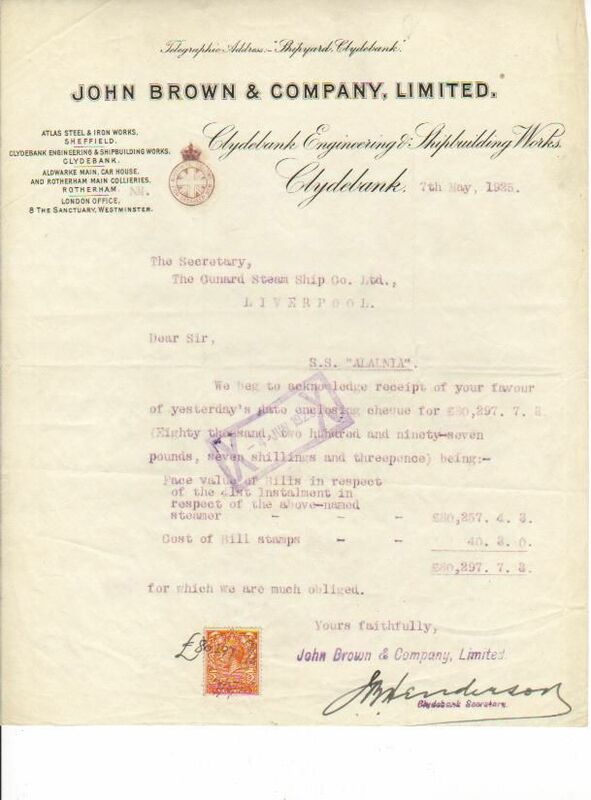 Receipt issued to Cunard Line from John Brown & Co. Ltd. in the amount of £80,297.7.3 as payment of 41st instalment for building the SS Alaunia. 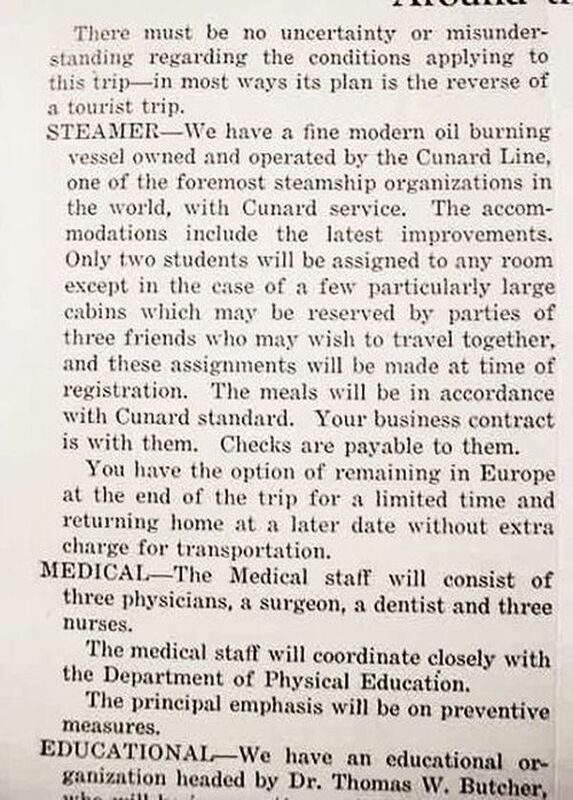 Dated 7th May 1925. 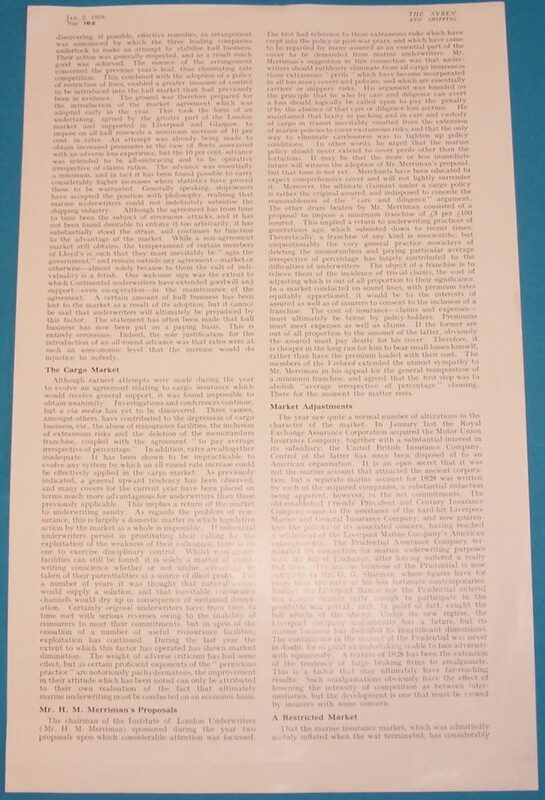 Two Pence tax stamp affixed. 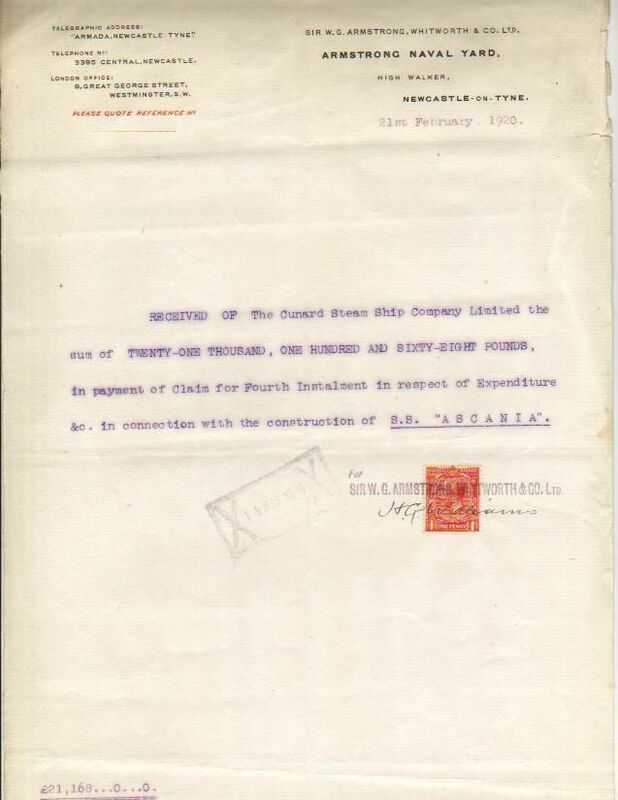 Receipt issued to Cunard Line from Armstrong Naval Yard in the amount of £21,868 as payment of 4th instalment of constructing the SS Ascania liner. 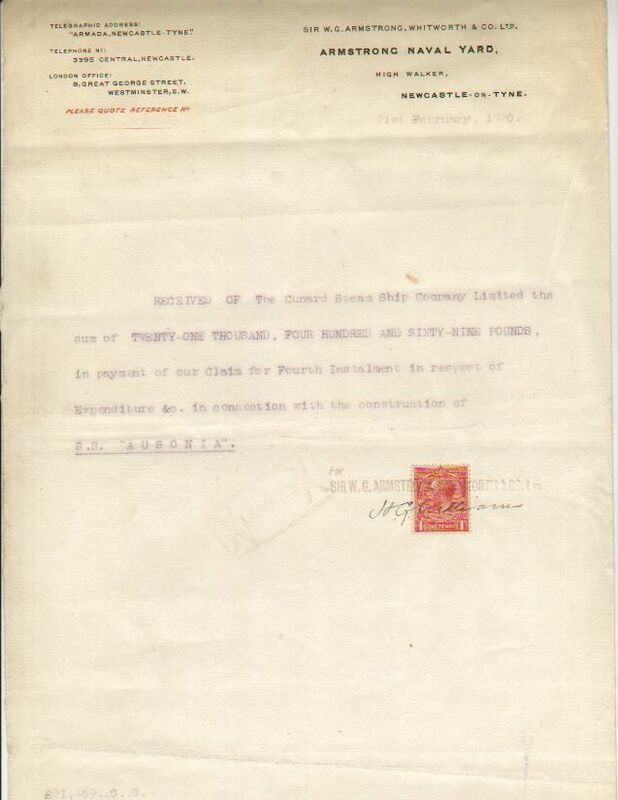 Dated 21st February 1920. One Penny tax stamp affixed. 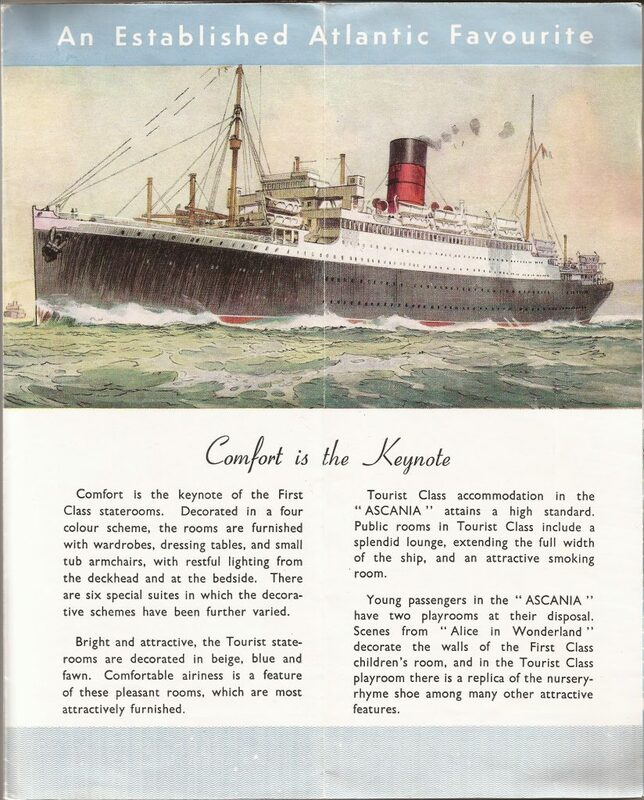 A rare Cunard Line publicity brochure from around 1928 just after the RMS Ascania had changed her accommodation to include an additional tourist class. 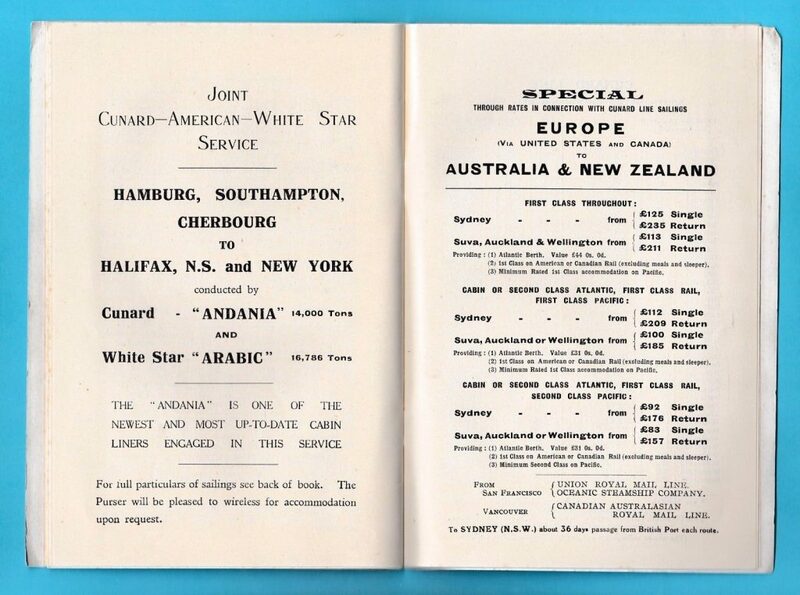 A rare Cunard White Star Line publicity paper brochure dated September 1935 just after the RMS Alaunia had changed her accommodation to include an additional tourist class. 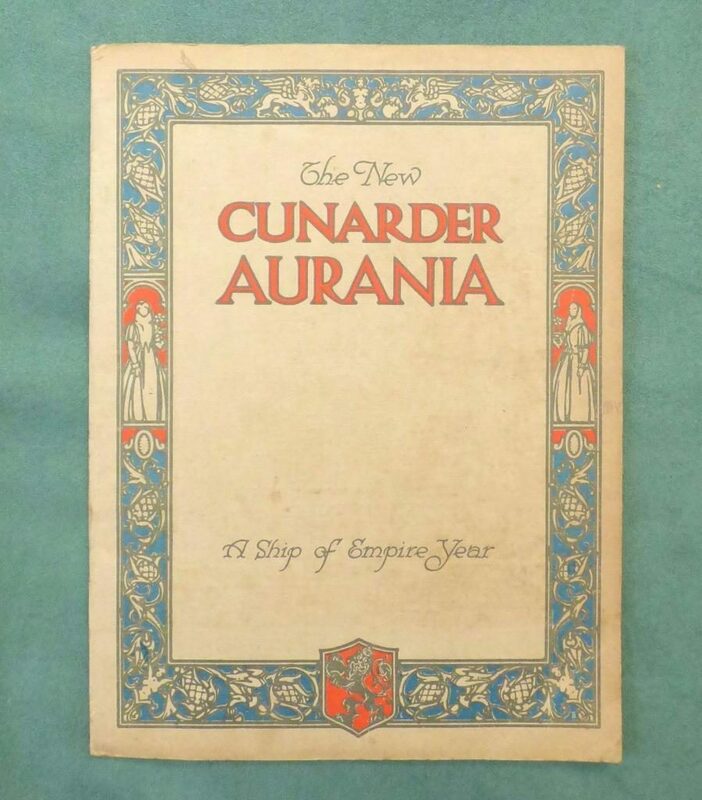 A rare Cunard White Star Line publicity paper brochure dated 1924 celebrating the launch of the “New Cunarder”, RMS Aurania. 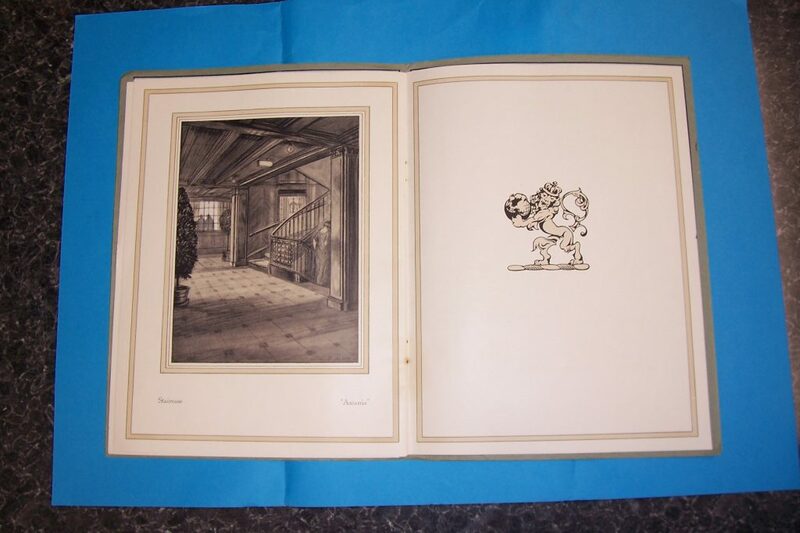 The brochure consists of printed hard covers with colour decoration and drawings which flow onto the next pages. 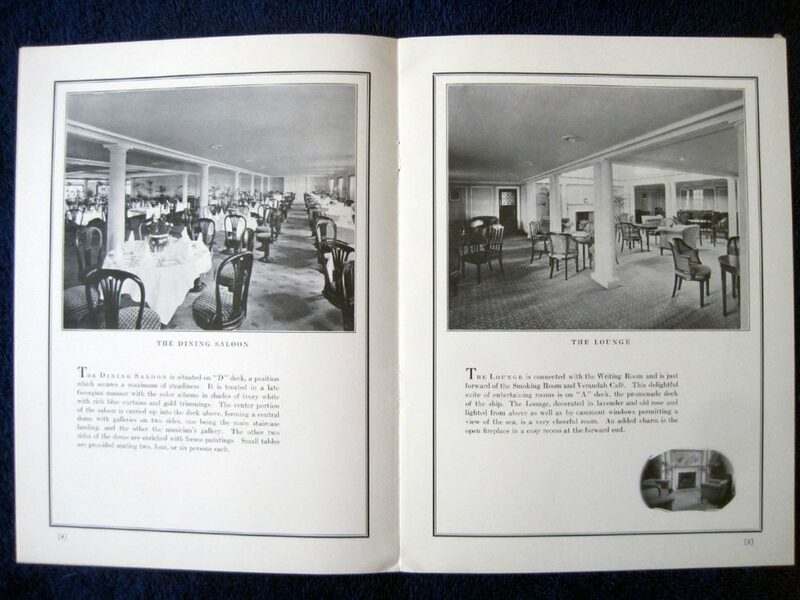 Inside it has pages with descriptive text about the ship and the facilities available to the cabin class passengers together with black and white images of the interior. 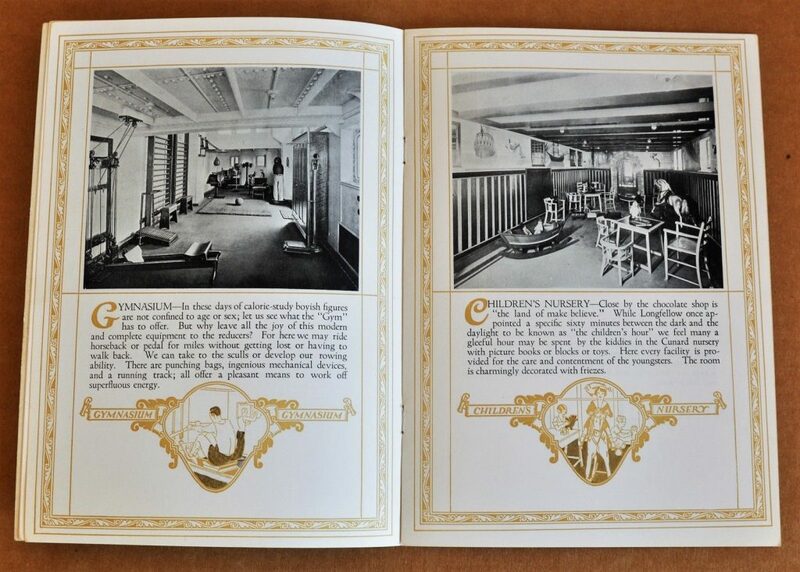 The following photographs are taken from a 16 page promotional booklet, although not dated, is almost certainly from the early 1920’s and was produced to publicise the new Cunard ‘A’ Class liners entry into service. 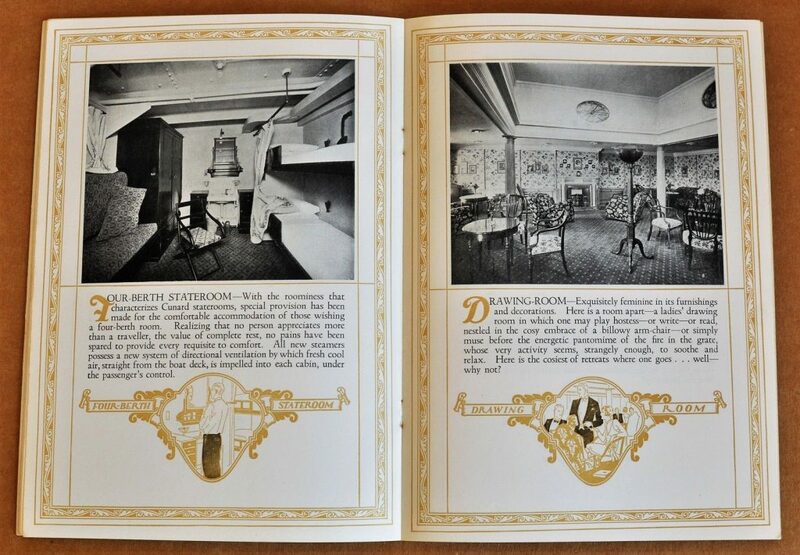 It provides rare photographs of the public rooms, suites and cabins, along with a brief description. 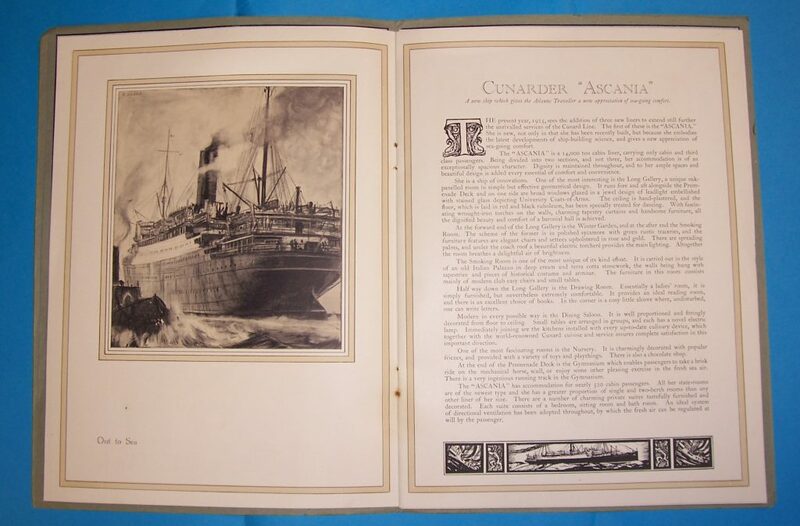 Printed in colour in an attractive layout of the style of the period, all six of the Cunard ‘A’ Class liners are featured. 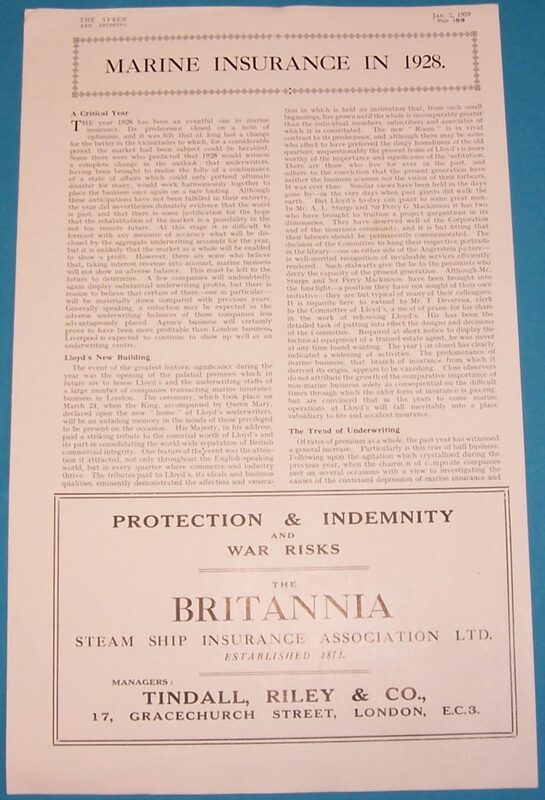 An advert for Vickers Armstrong Ltd, which proudly shows the RMS Ausonia. 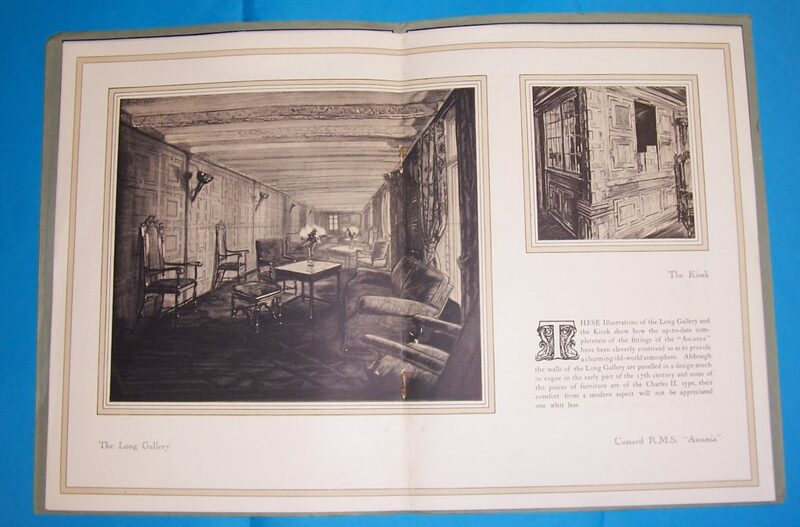 This is an original advertisement published on the 2nd January 1929, printed on two separate pages (about 13 inches by 8.5 inches), which have been carefully cut from the Syren & shipping illustrated magazine. 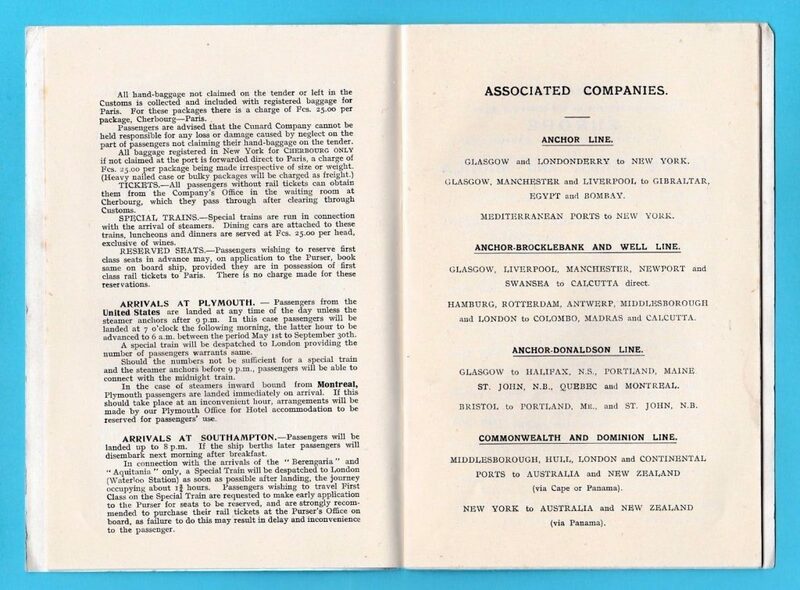 The Syren & shipping illustrated was a weekly shipping journal that covered almost anything to do with shipping and the related industries, but concentrated mainly on shipyard launches, sea trials and the ‘handing over’ of vessels to shipping companies and then their maiden voyages. 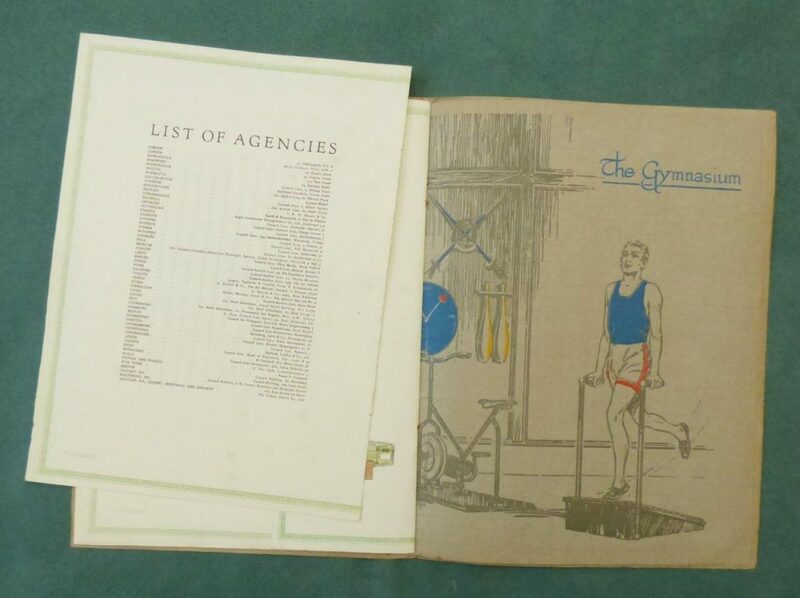 First published in 1897, the journal was produced for a highly-specialised readership and was mostly found on the tables of shipping magnates and the waiting rooms of related businesses. 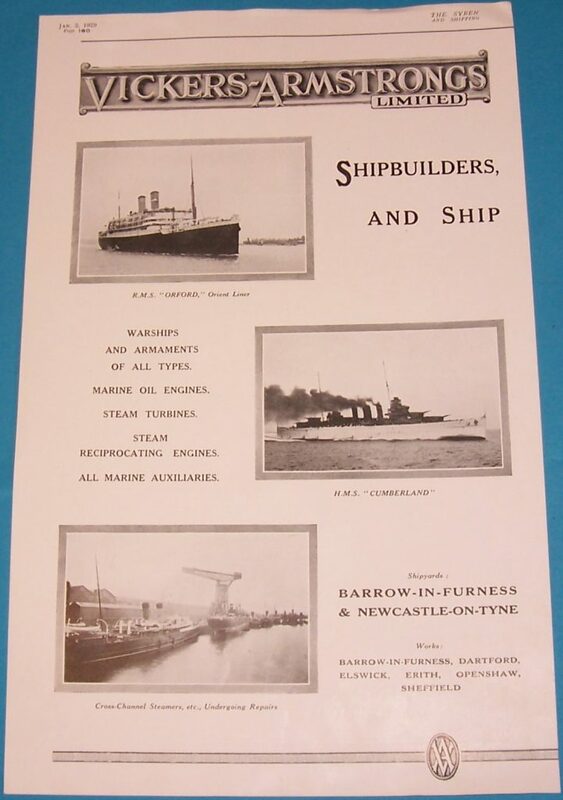 It met its demise in 1966, along with most of the British shipbuilding industry and the ‘flagging out’ of so much of her merchant fleet to cheap ‘flags of convenience’. 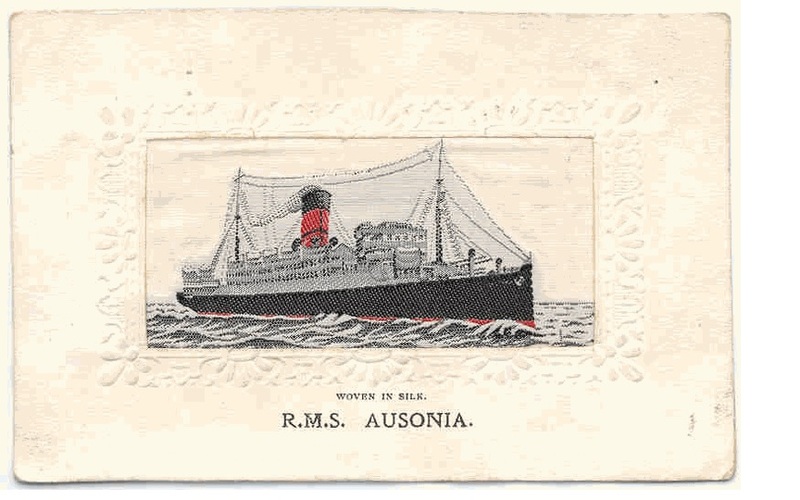 A souvenir RMS Ausonia picture, woven in silk. 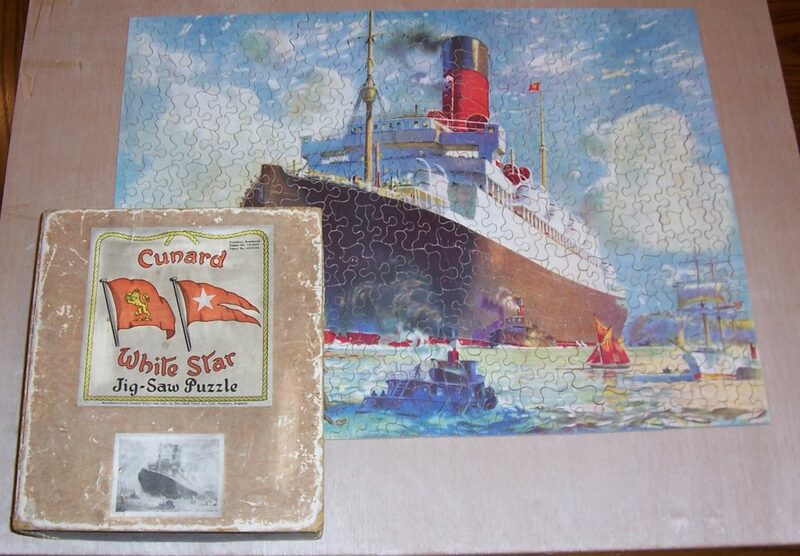 A rare Cunard White Star Line jig saw puzzle of RMS Ausonia dating from the 1920’s, which would have been purchased on board the ship, to help pass the time. 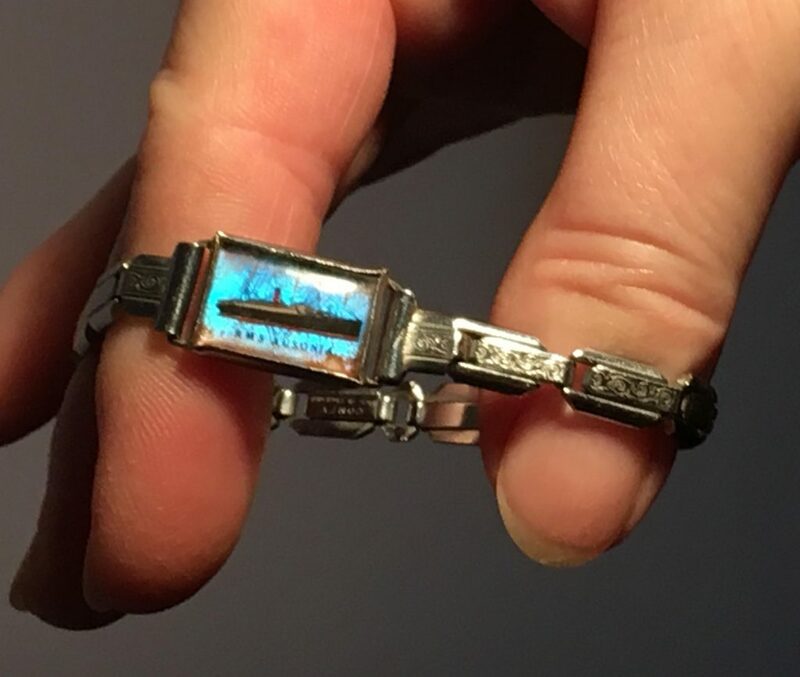 Rachel Esleem sent me the following photographs of a bracelet that was given to her when she was 9 years old. 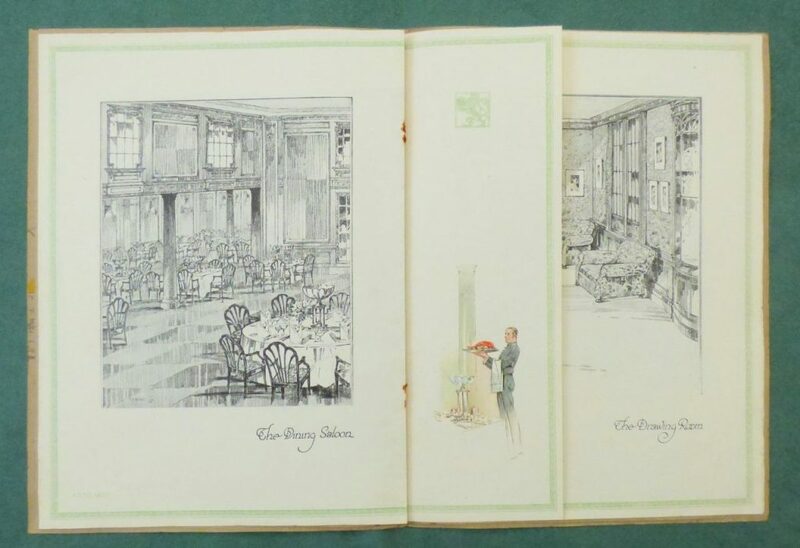 At the time, Rachel lived in Swindon in the historical railway village and next door was a pub called The Cricketers Arms. 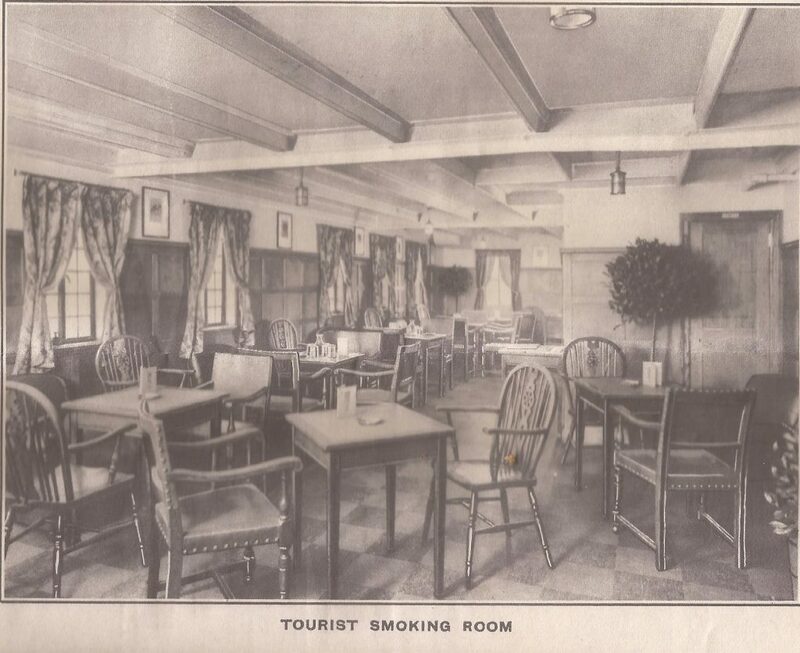 Her mother used to work as the barmaid, so they were very friendly with the landlord and landlady. 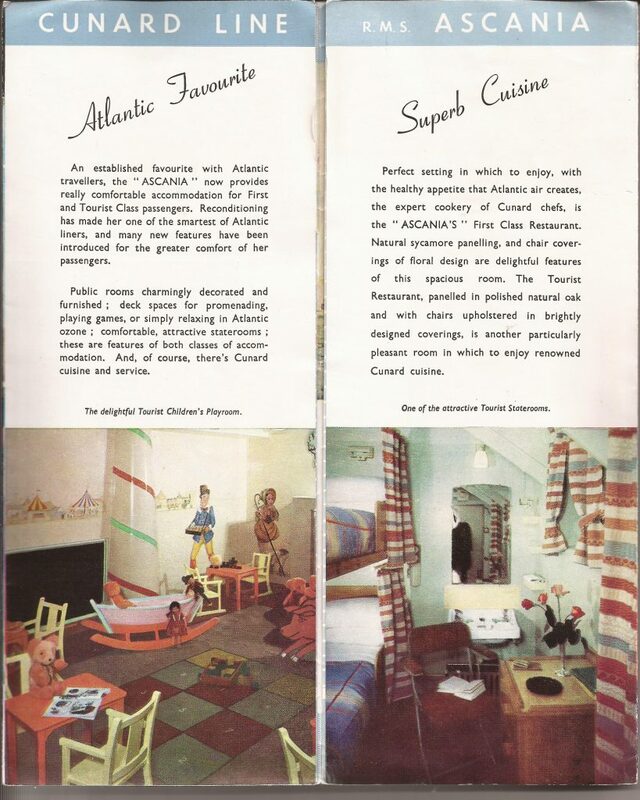 One day the landlady was showing Rachel her jewellery and came across the Ausonia bracelet in its own box. The hand painted picture depicts Ausonia and is mounted on to a butterfly wing type bracelet. 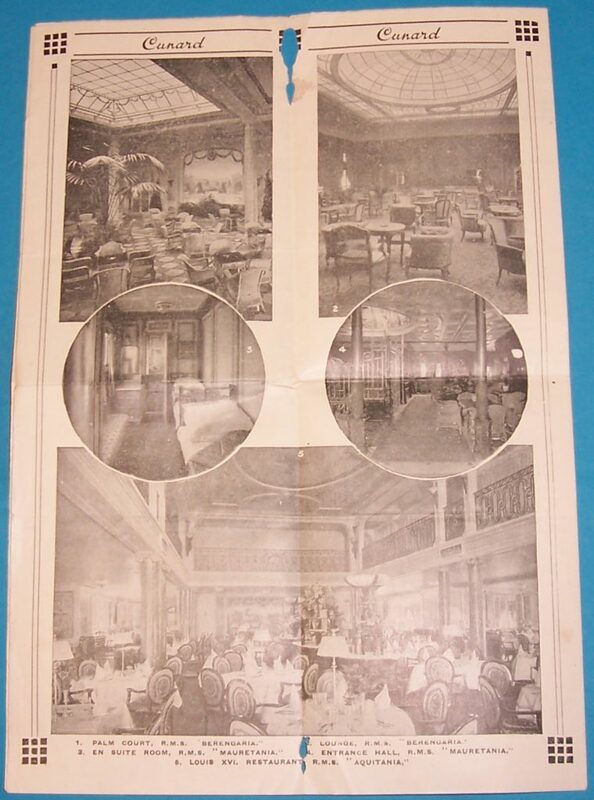 The landlady said that the bracelet had belonged to her mother and that she had got it whilst on board the ship. She handed Rachel the bracelet and said that she wanted her to have it, but never to wear it. Although the picture is still clear, regrettably it shows signs of water damage after Rachel got it wet while wearing it! 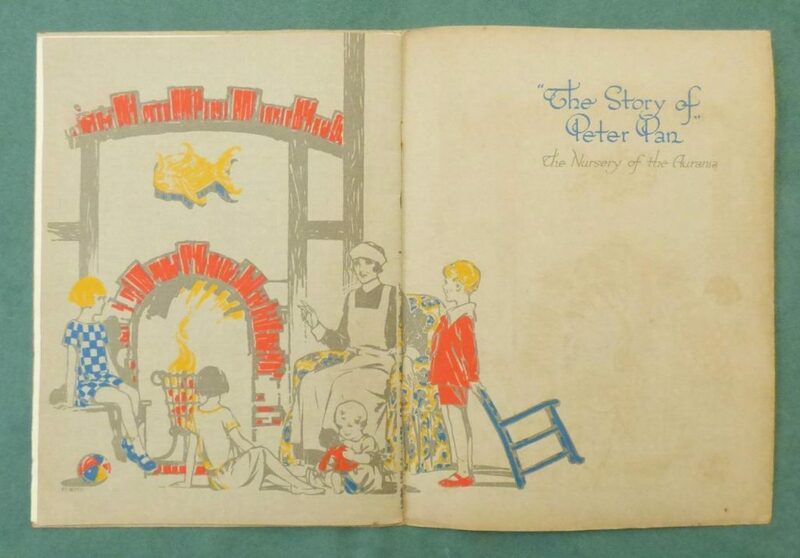 (Neither of her parents were present at the time, so she sadly ignored the landladies advice and even threw away the box). 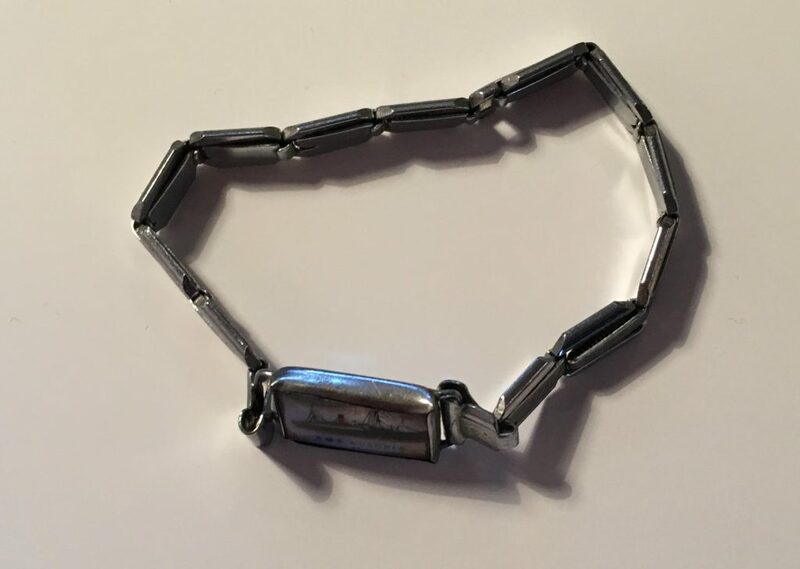 It is difficult to put an exact date on the bracelet, but it was probably made in the early 1920’s. Similar to the hand painted enamel pictures on brooches and tie clips made at the time, this painting is unusual in that it appears to be a silk embroidery picture. 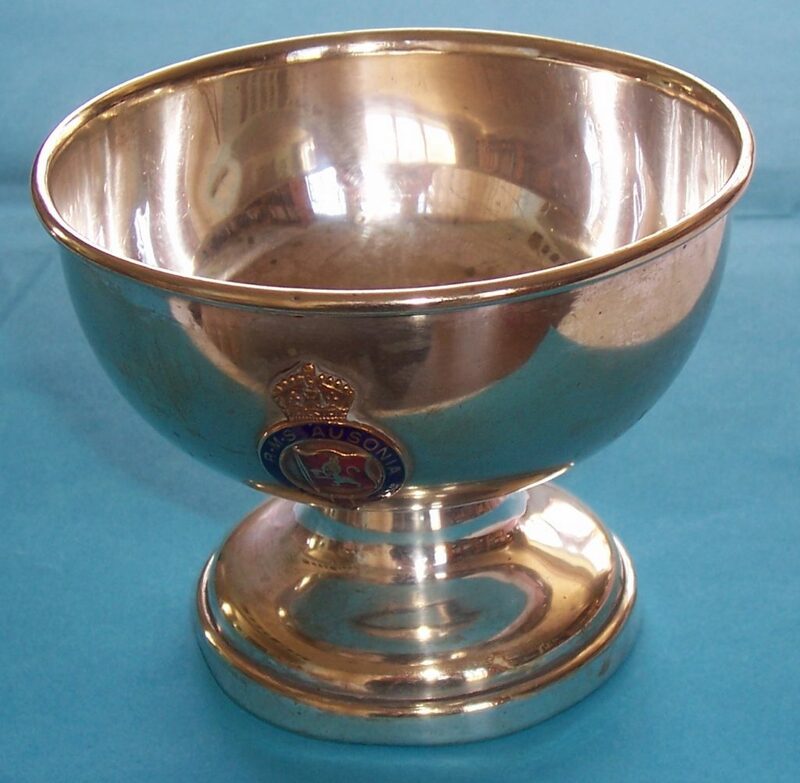 If anyone can supply more information on the item, please get in touch using peterjryder@gmail.com and I will pass it onto Rachel who is eager to know more. 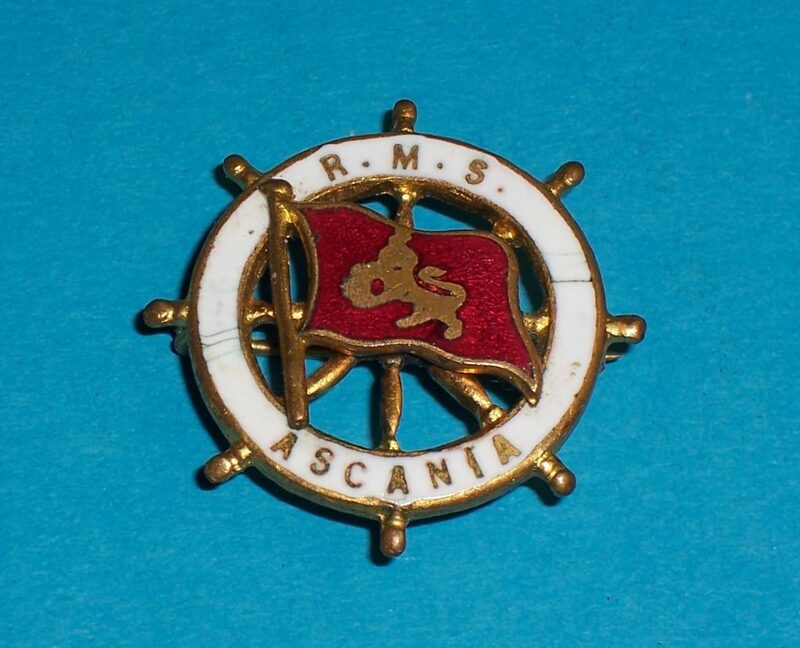 An enamel, ship wheel pin badge from RMS Ascania dating from the 1920’s, which would have been purchased on board the ship. 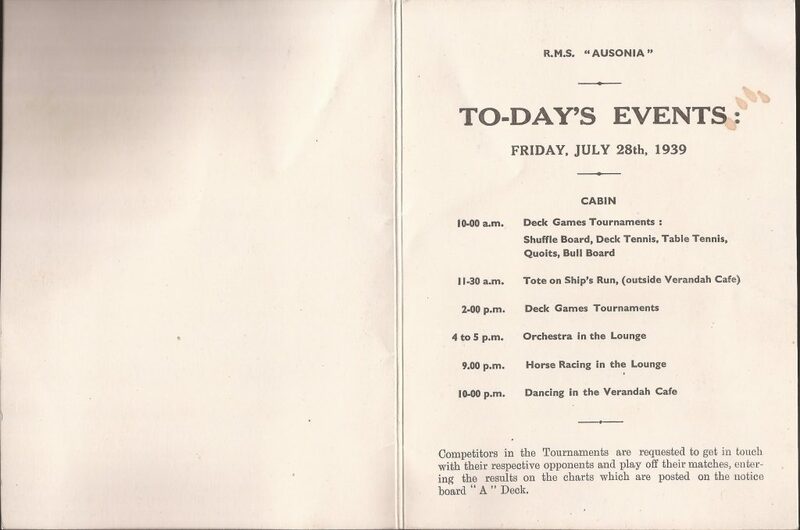 A RMS Ausonia daily programme of events, dated Friday 28th July 1939. 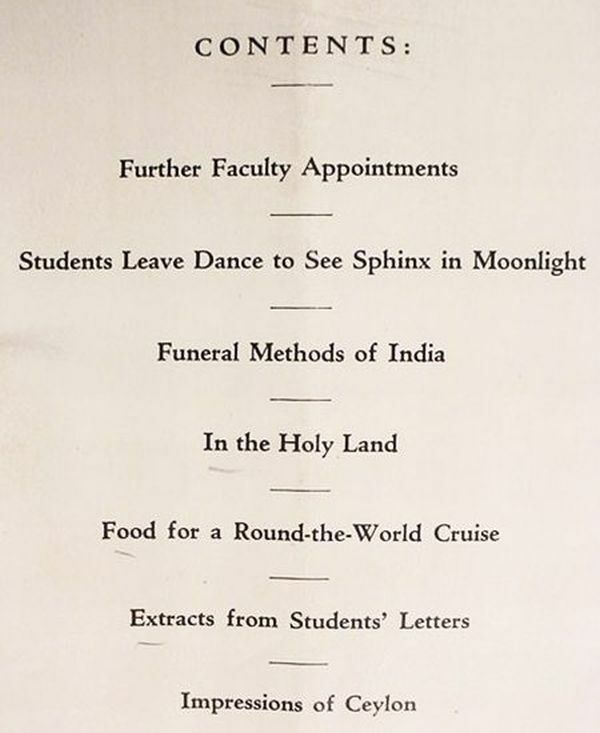 Printed on-board, the programme lists the events planned for that day. 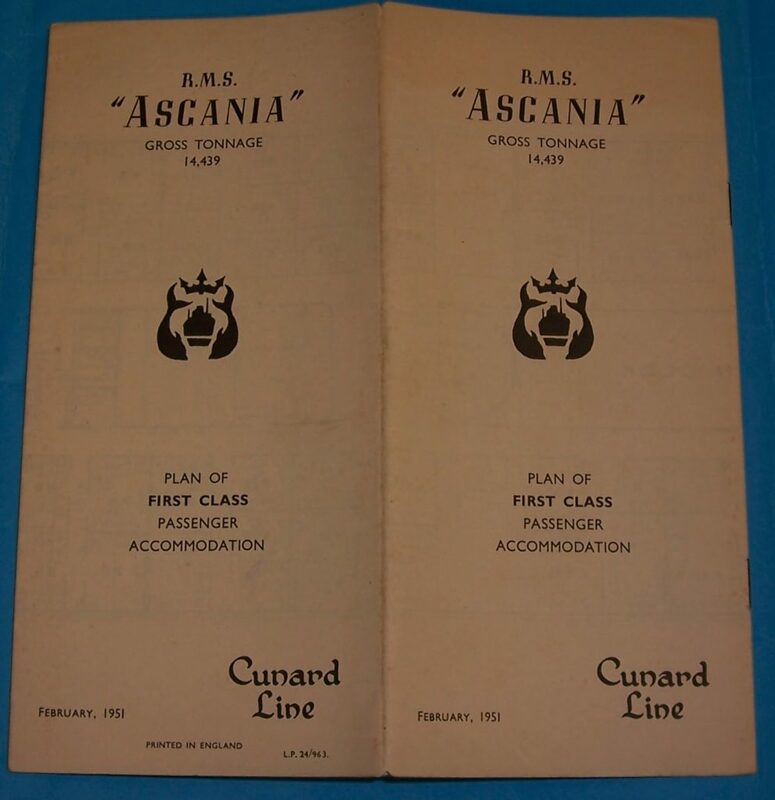 This programme is one of the last ever printed for Ausonia, as this was her last recorded weekly sailing to Canada, (with Cunard White Star). 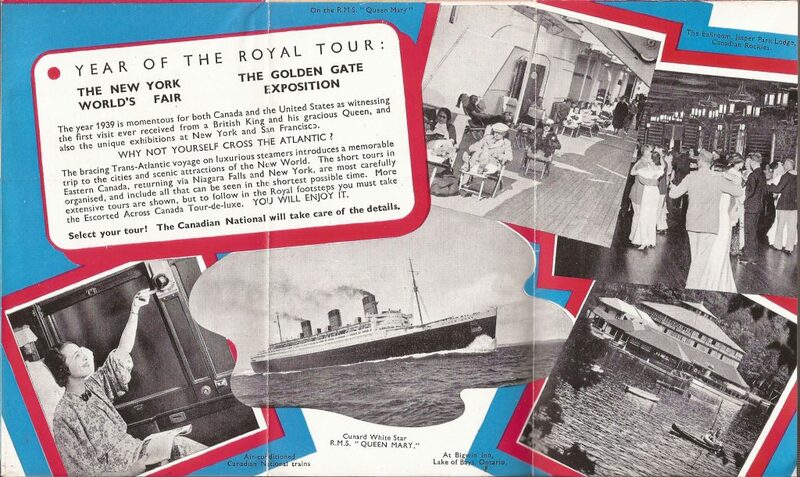 She arrived in Montreal two days later, on the 30th July 1939 and disembarked 382 passengers. 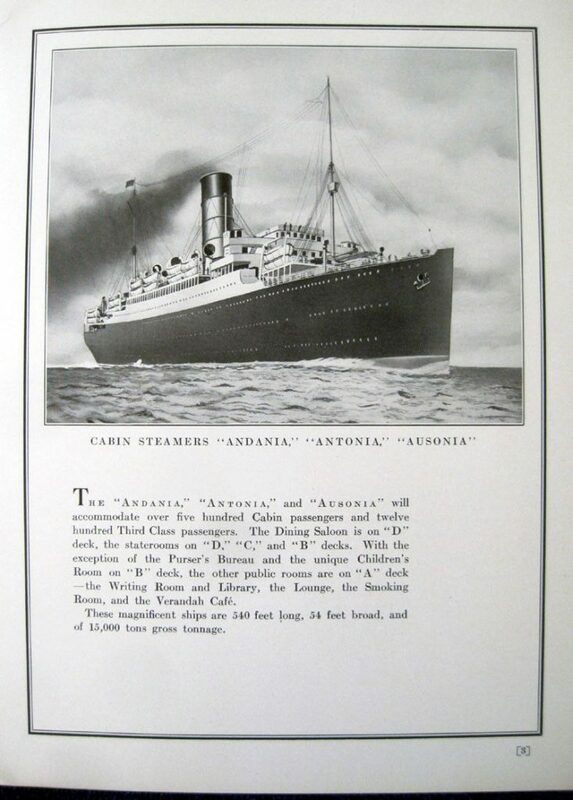 A few days later RMS Ausonia left Montreal on her last fare paying voyage, calling at Quebec-Plymouth, Le-Havre, London and Southampton. 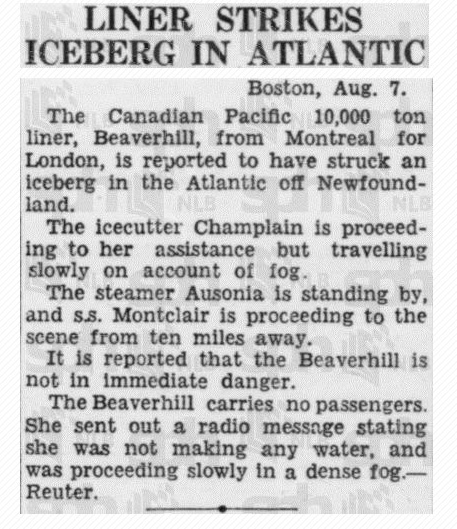 A few days after her departure from Canada in the first week of August 1939, RMS Ausonia was reported in The Straits Times, the main newspaper for Singapore, as standing by the Canadian Pacific passenger liner, Beaverhill, after she had struck an iceberg in thick fog off Newfoundland. 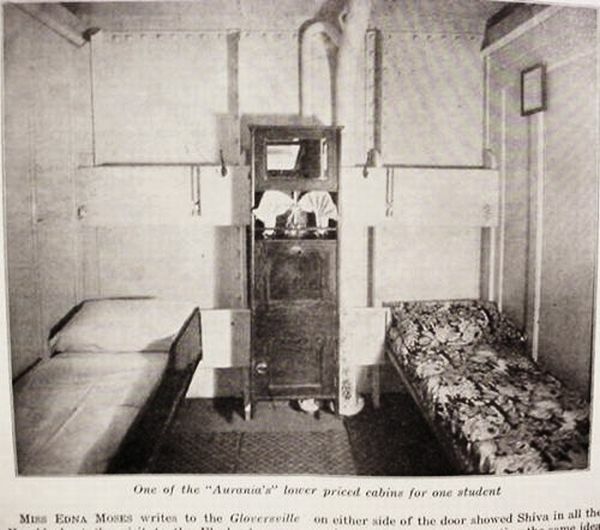 RMS Ausonia was not required to give assistance and she continued with her schedule. 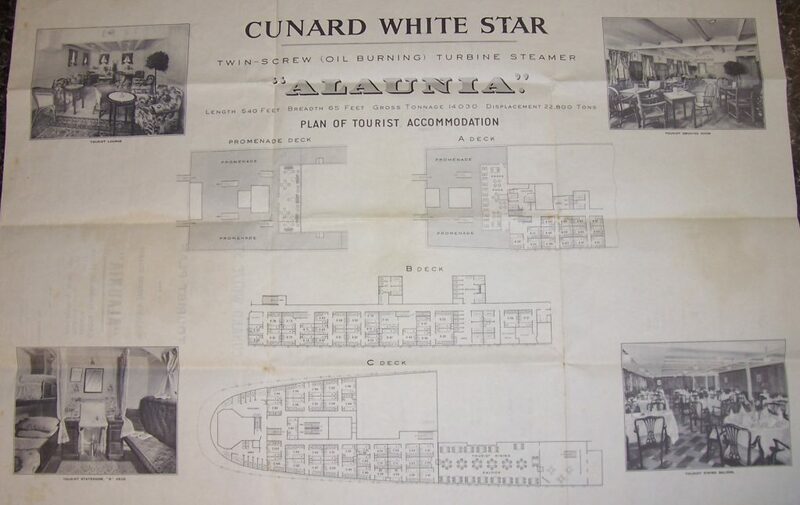 On the 2nd September 1939, Cunard White Star was informed that the Ausonia had been requisitioned, war was declared the next day, the 3rd September 1939. 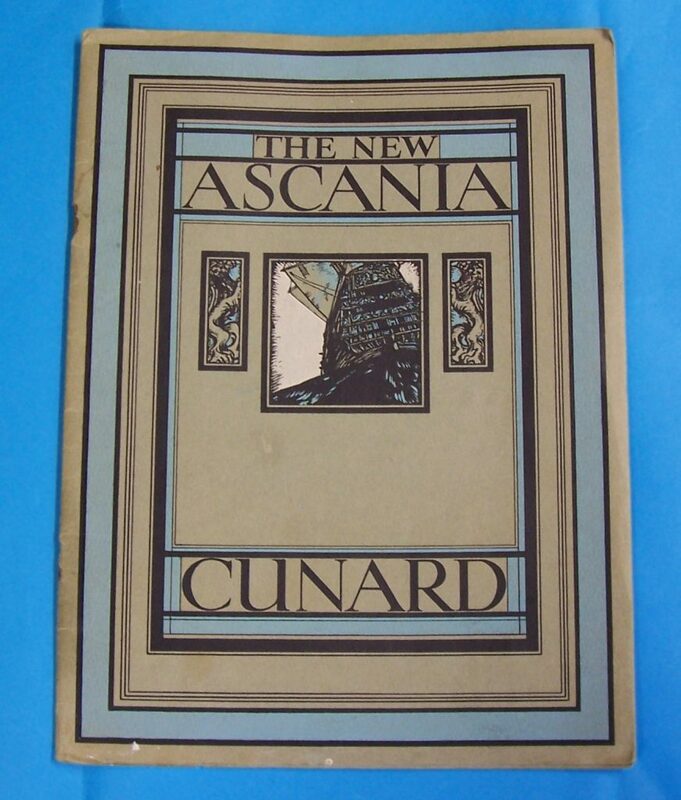 This rare Cunard publicity brochure, dating from 1925, is announcing the new Cunard liner, RMS Ascania. 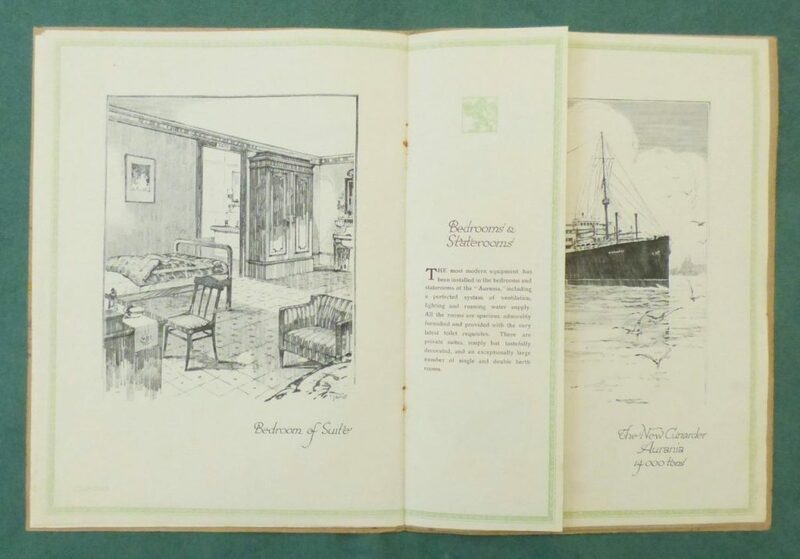 This 12 page brochure, measuring 25cm by 33cm, has 13 lovely pencil drawings of the interior of the ship, drawn by the artist, Rowland Hilder. 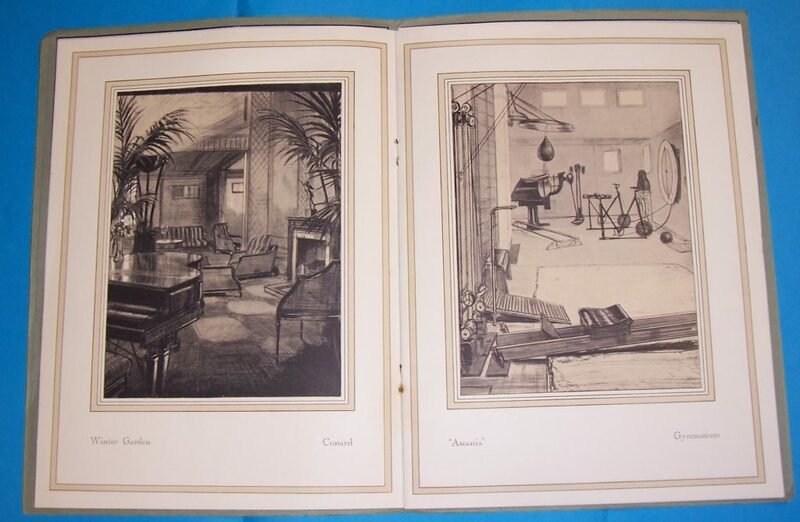 Rowland Hilder was a famous painter of English landscapes and seascapes. 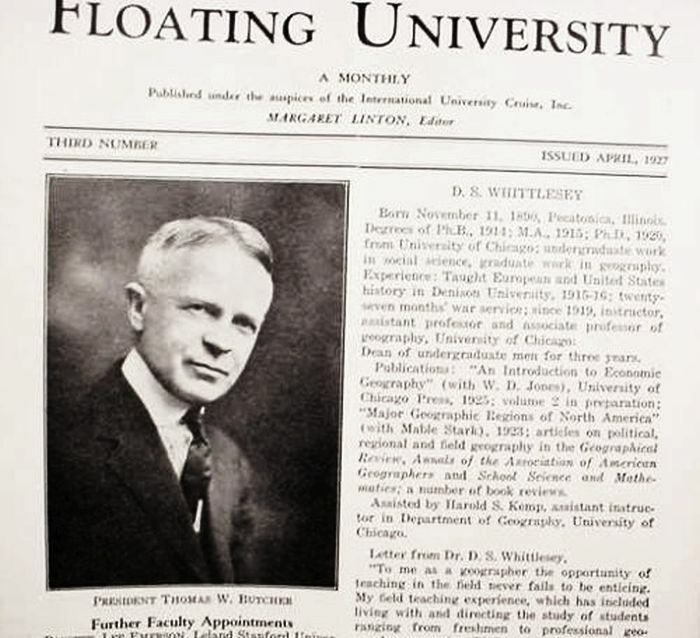 Born in 1905 in Long Island, USA, his parents brought him back to England in 1915, when, with the outbreak of the First World War, his father decided to enlist in the British Army. 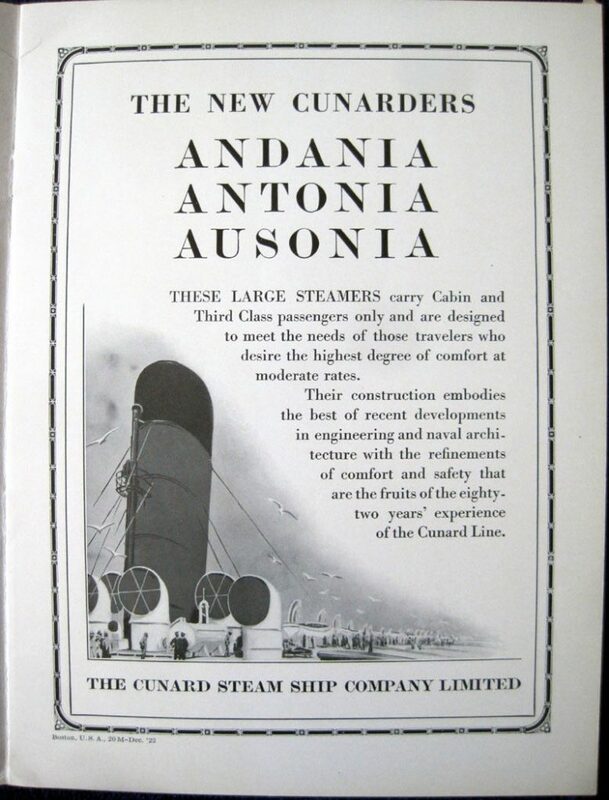 Described as ‘the Turner of his generation’ following his renowned landscape paintings of the Kent countryside, he was commissioned by Cunard to produce these drawings for the launch of the liner Ascania. 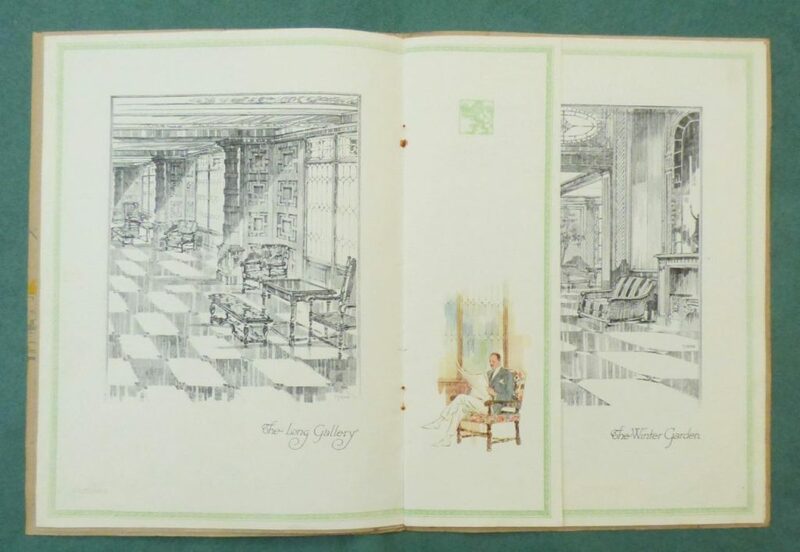 Following his Cunard brochure illustrations, Hilder was commissioned by Oxford University Press to illustrate books and his decorative end papers and black and white drawings of “Treasure Island” in 1929, won him The Times illustrator’s award and this lead to him doing the illustrations for several more books in the 1930’s. 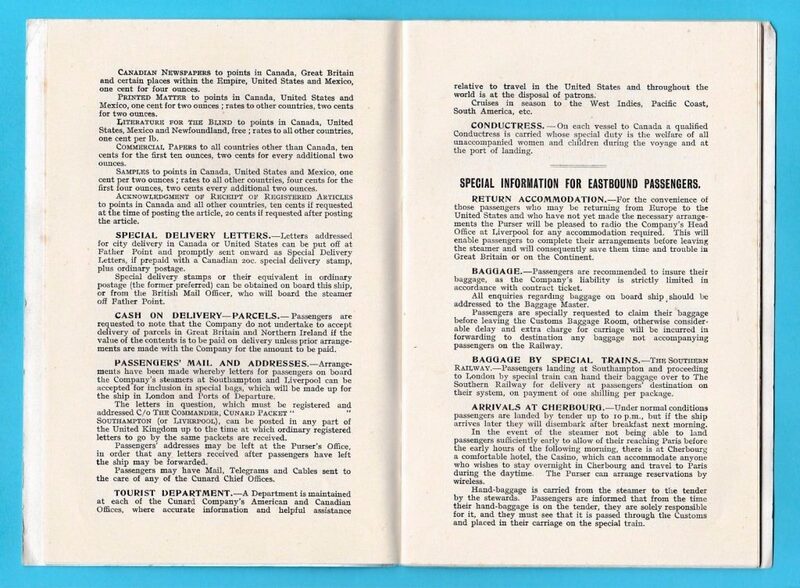 During the Second World War, Hilder served as an army camouflage officer and he became the mainstay of the Ministry of Information. 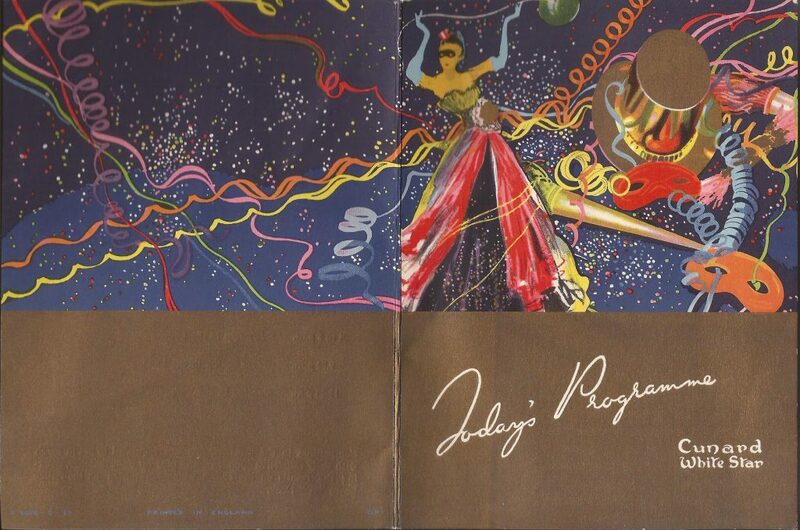 In 1953 Rainbird commissioned him to create the Shell “Flowers of the Countryside” series. 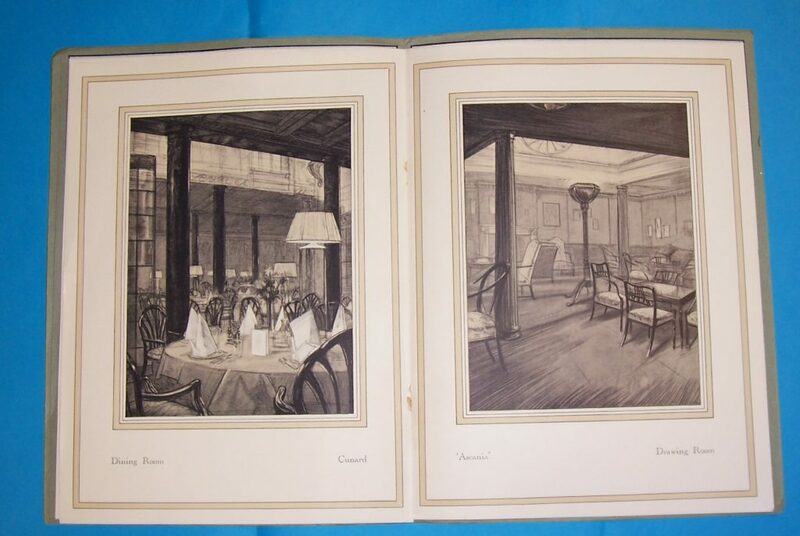 Demand was so great that Shell set up an office to deal with correspondence and 13 million plates were published. 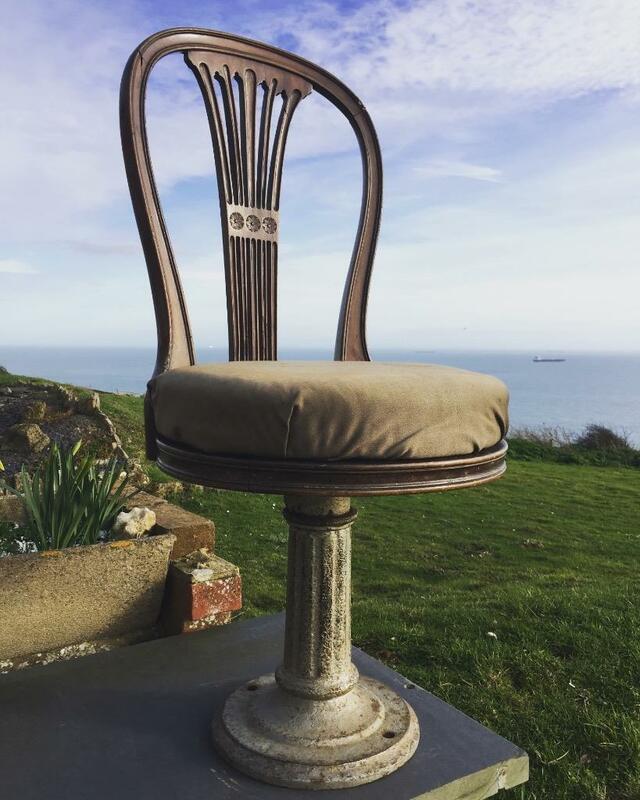 One of the rarest artefact’s from any of the Cunard `A’ Class liners to come onto the market is this mahogany and cast iron ships dining room swivel chair, from the ships 3rd Class dining room from RMS Aurania. 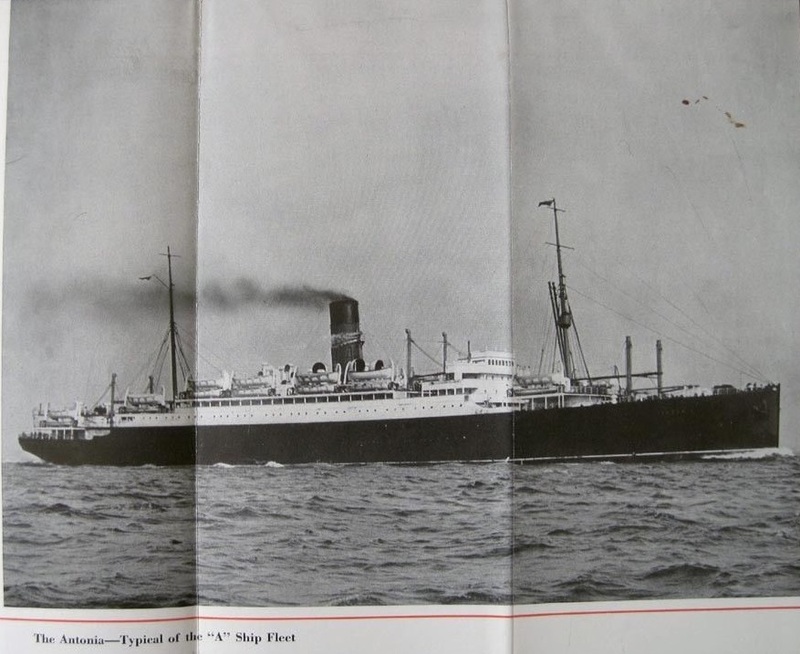 This unusual survivor is likely to have been removed along with the majority of the ships fixtures and fittings during her conversion to the repair ship HMS Artifex, in 1942. 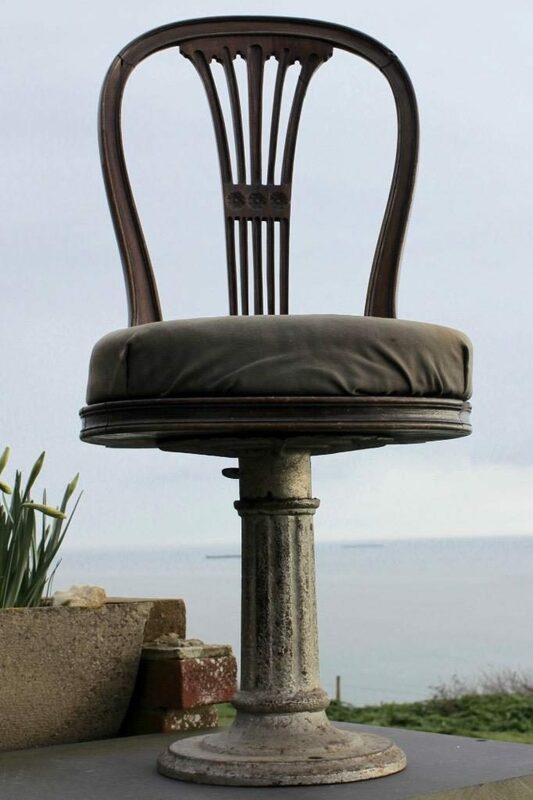 Standing at 37″ tall, the seat is showing signs of its age, (but considering that it must have been made prior to the ships launch in 1924, it is in good condition), the quality wood work is untouched and the cast iron pedestal is still in its original silver Cunard paint finish, with the horse hair padding and strapping of the original seat still present. 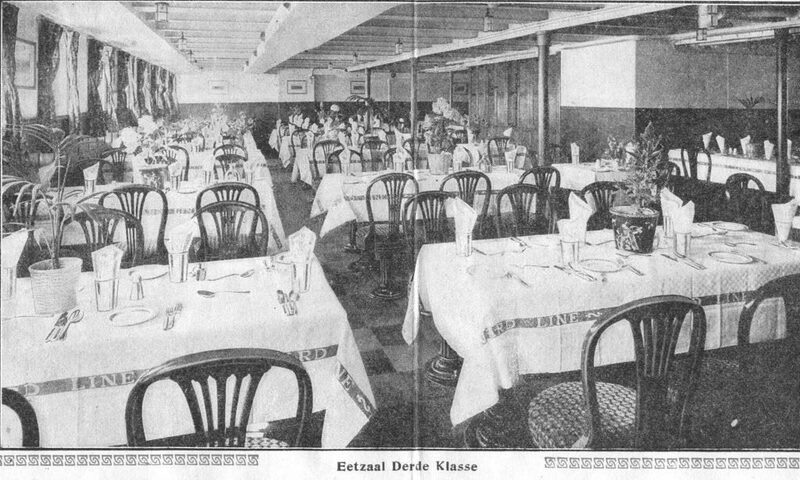 The Cunard `A’ Class ships all used the same cast iron pillar base in their 3rd Class dining rooms, but the seat back and wooden elements of these seats were all different and unique to each ship. 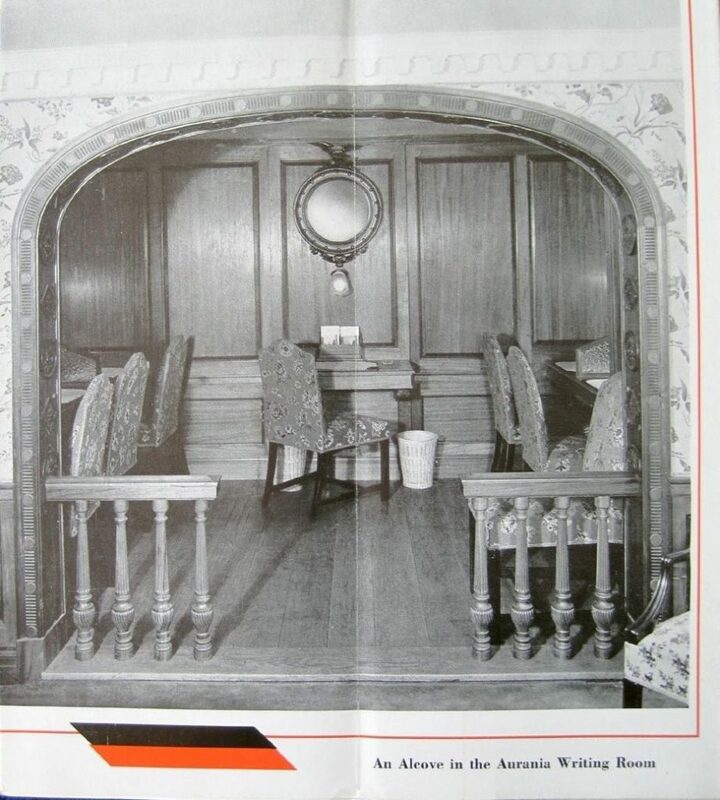 In RMS Aurania’s case, the seat back is comprised of turned supports, which can be seen in the postcard below from the early 1920’s. 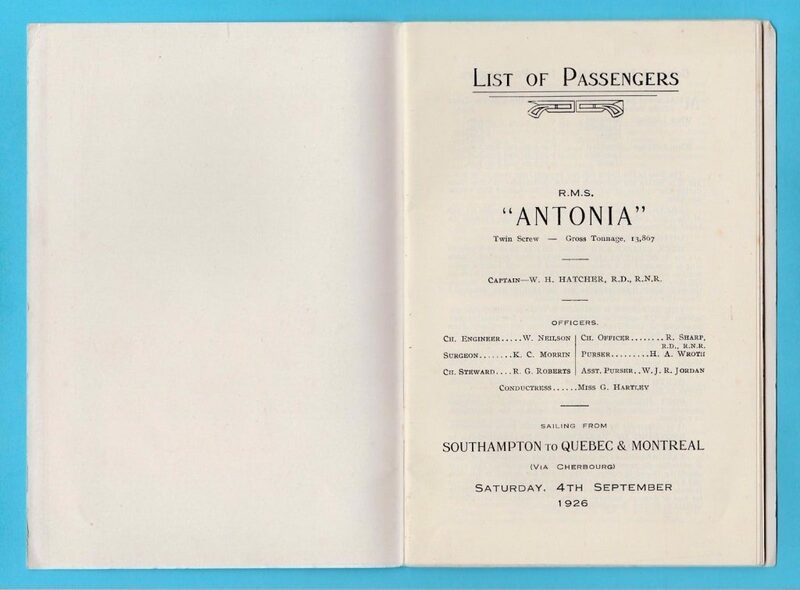 A rare Cunard Line passenger list information brochure for RMS Antonia, for her sailing from Southampton to Quebec and Montreal, dated 4th September 1926. 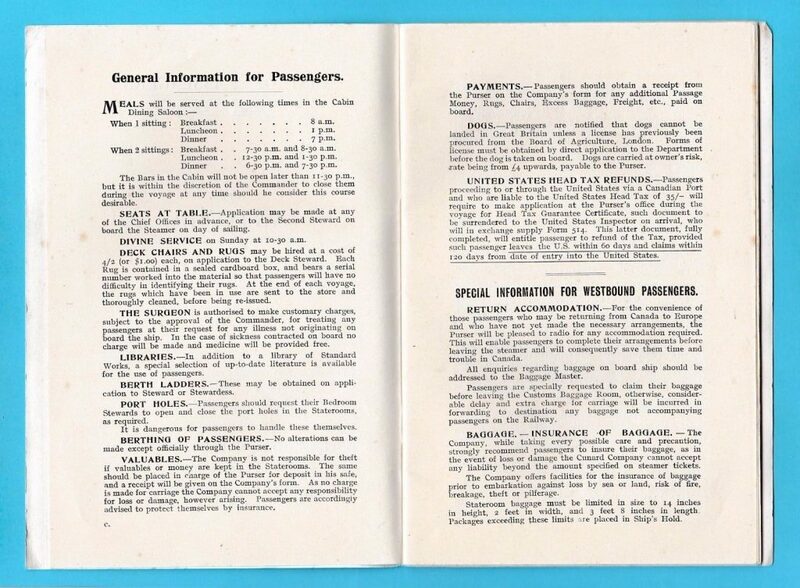 It is hard covered with 36 pages inside, which not only lists all the passengers, but also provides a travel chart, map and useful general information for the passengers, while on board. 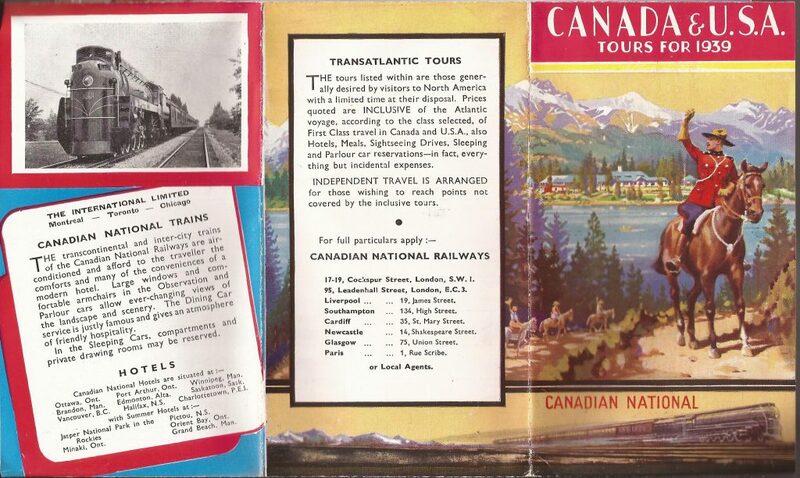 A Transatlantic tours brochure from 1939, which lists tours “generally desired” by visitors to North America and was organised by Canadian national Railways. 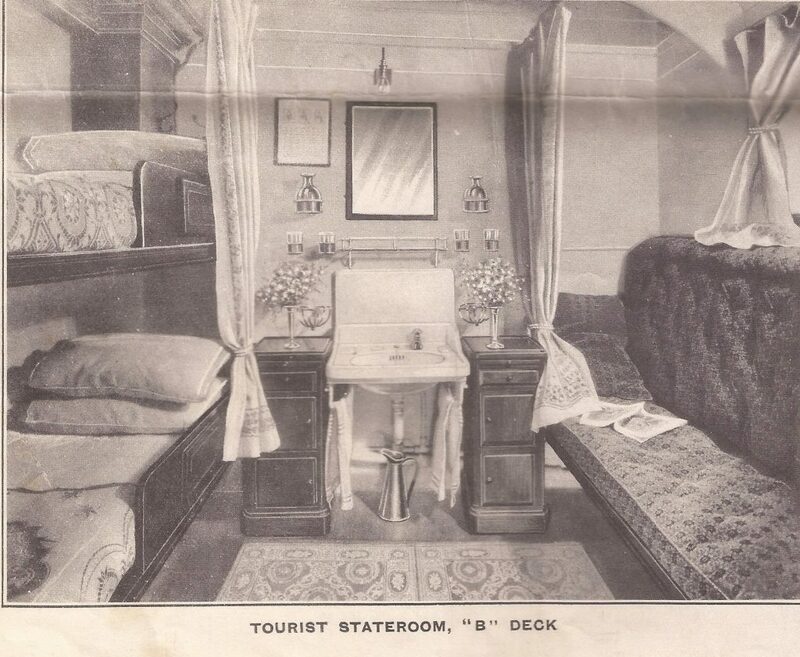 The idea was that you would take passage across the Atlantic in one of the listed Cunard liners and then travel inland by train, staying on board the train in one of the sleeping compartments or in a hotel, when visiting cities. 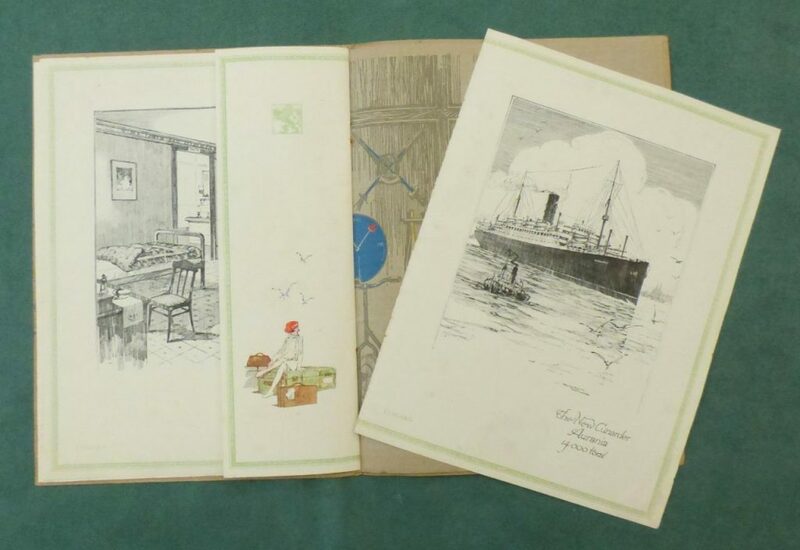 The outbound sailings from Liverpool or Southampton were on all six of the Cunard ‘A’ class ships, along with the Athena and Letitia and lasted on average, between 21 and 29 days. 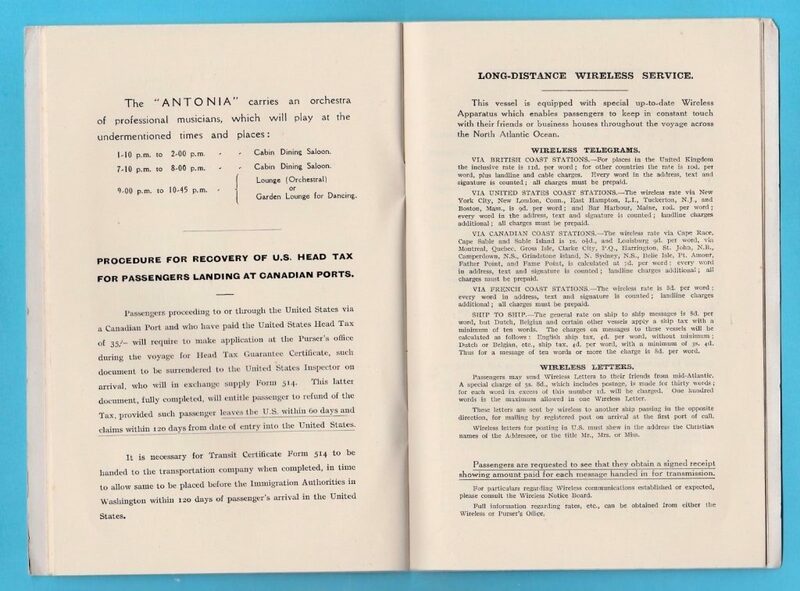 The longest tour of 45 days, named the “Across Canada Tour De Luxe” was on either Antonia or Alaunia and stopped at Quebec, Eastern Canada, Jasper Park, Pacific, Banff, Minaki and New York. 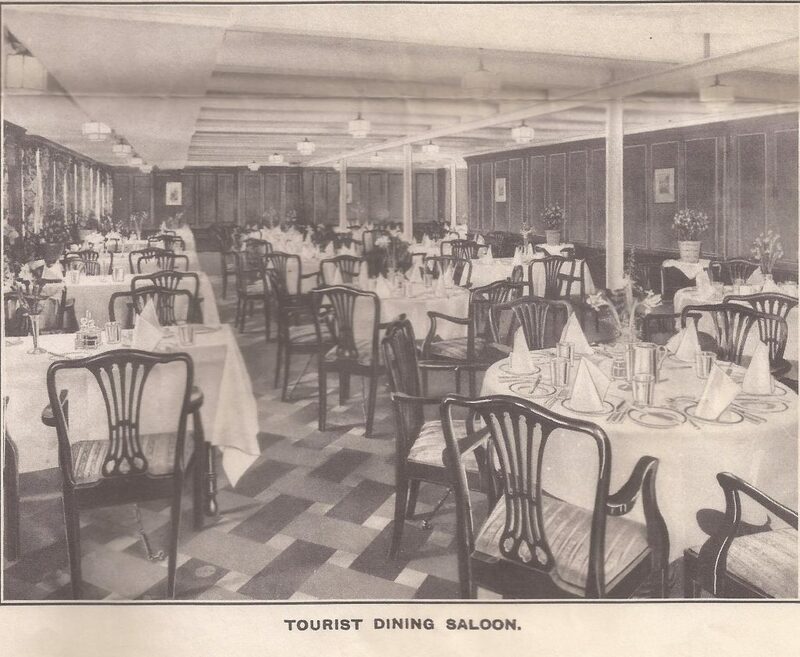 The return sailings only featured two of the Cunard ‘A’ class ships, Ausonia and Aurania, but also included some of the greatest ships of the time, Queen Mary, Scythia, Britannic, Carinthia, Mauretania, Laconia, Aquitania, Georgic, Franconia. 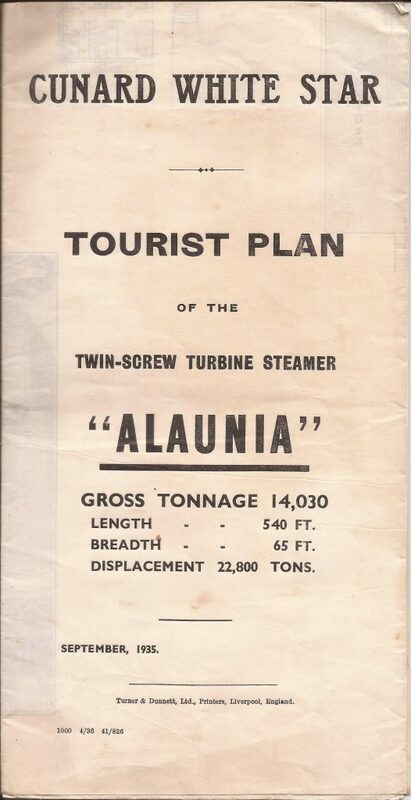 The last tours listed in the brochure, with outbound sailings on the Aurania, Andania, Ascania and Ausonia in September 1939, were obviously cancelled due to war being declared on the 1st September 1939. 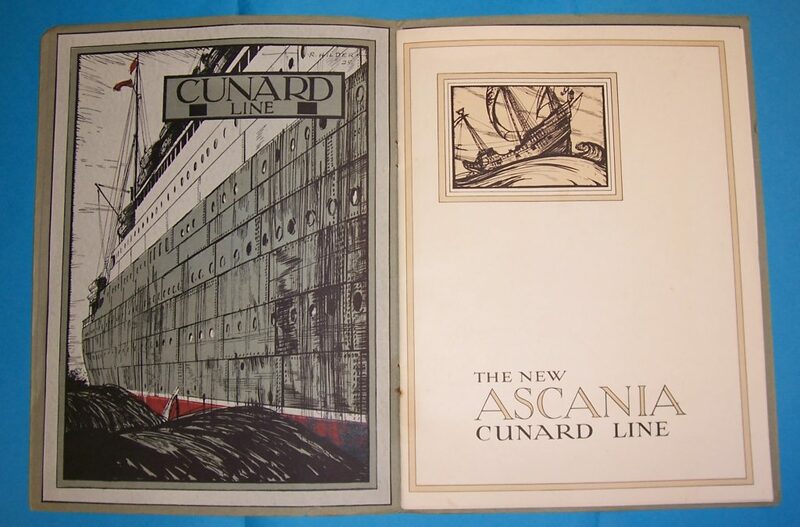 For this reason, the brochure is probably one of the last ever printed, which featured all six of the Cunard ‘A’ class ships together, as only the Ascania was to return to Cunard service after the war. 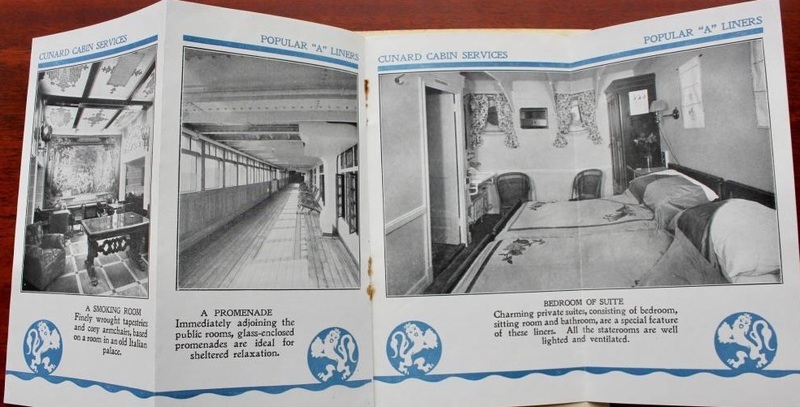 A rare Cunard Cabin Services information brochure from the 1930’s for the “Popular A Liners” of the Cunard line. 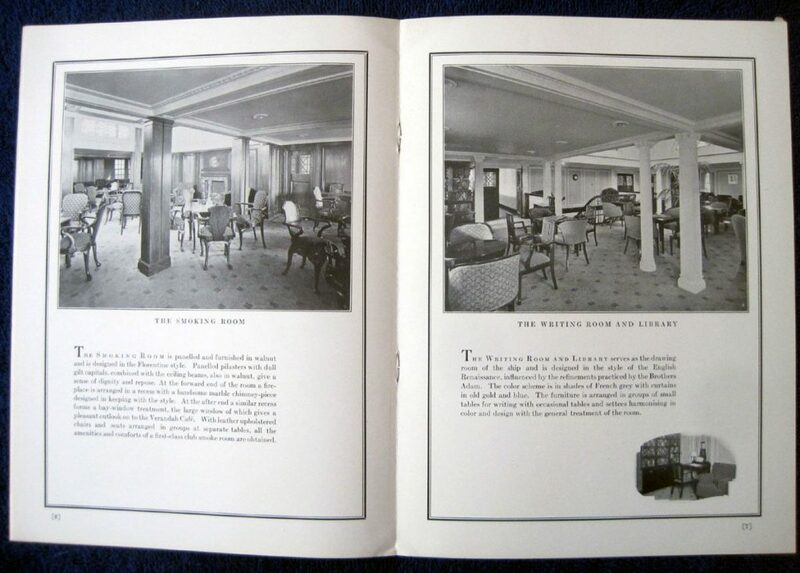 The brochure provides general information for the passengers and includes photographs of the smoking room, promenade deck, bedroom suite, the long gallery, drawing room, lounge, stateroom and the winter garden. 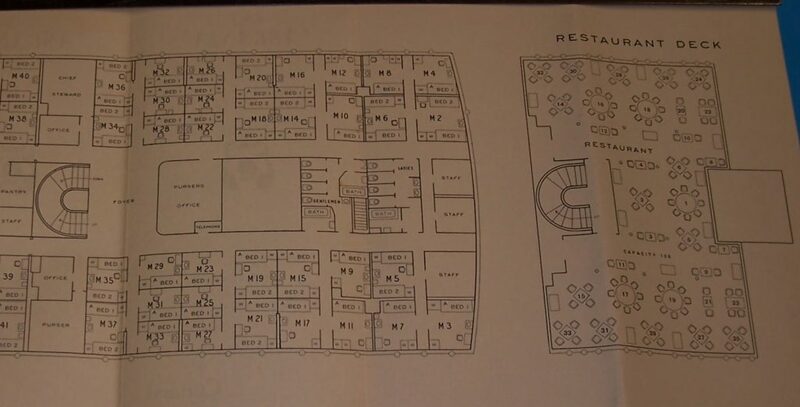 A rare Cunard Line information brochure illustrating the First Class accommodation of RMS Ascania following her post war remodelling showing the location of cabins and passenger facilities. 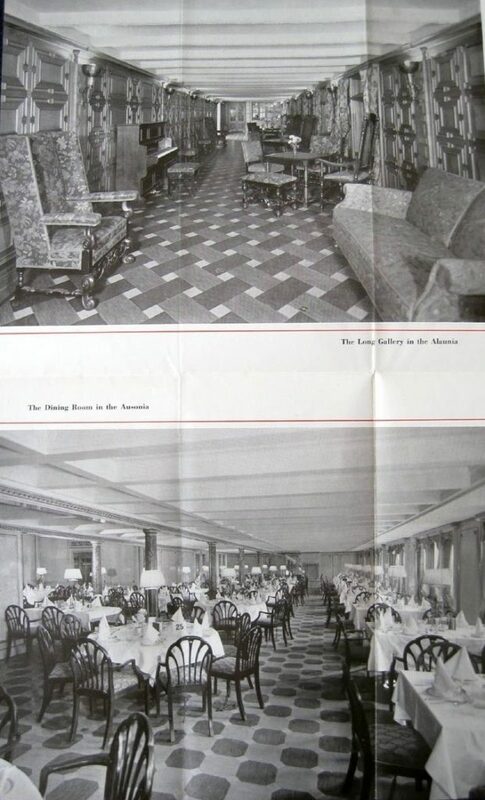 The plan is dated February 1951 and shows the Sun Deck, Promenade Deck and the Main Deck. 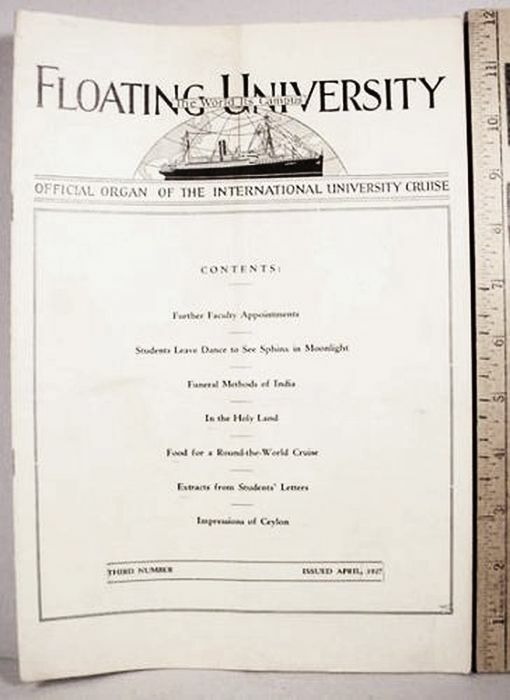 A rare, 20 page promotional newspaper for the “Floating University” published by the International University Cruise Inc. 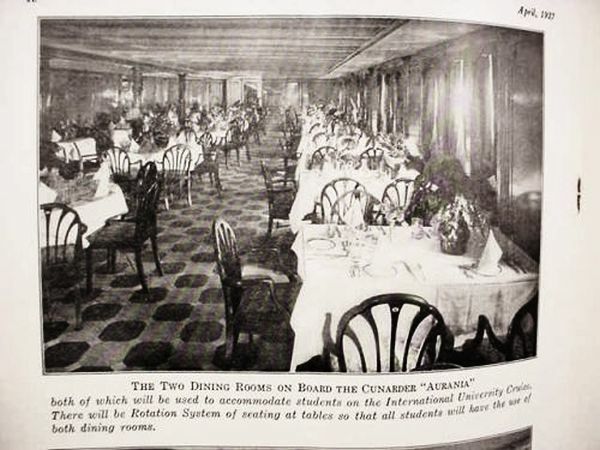 Dated April 1927, it is illustrated with black and white photographs and features the accommodation and public areas available to the students on board RMS Aurania. 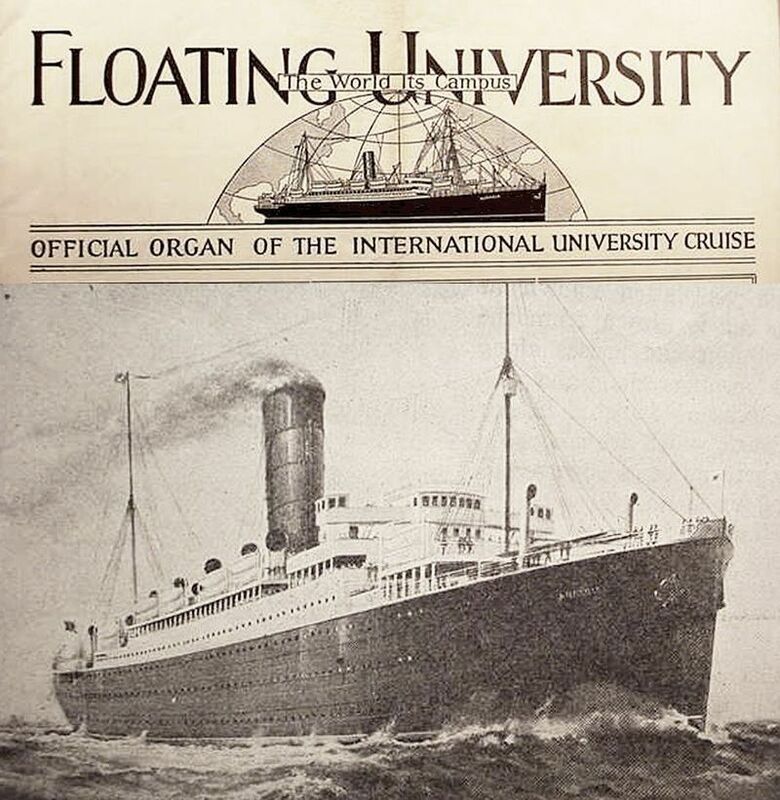 Still operating today, the International University Cruise was developed to educate individuals with the global understanding necessary to address the challenges of the world. 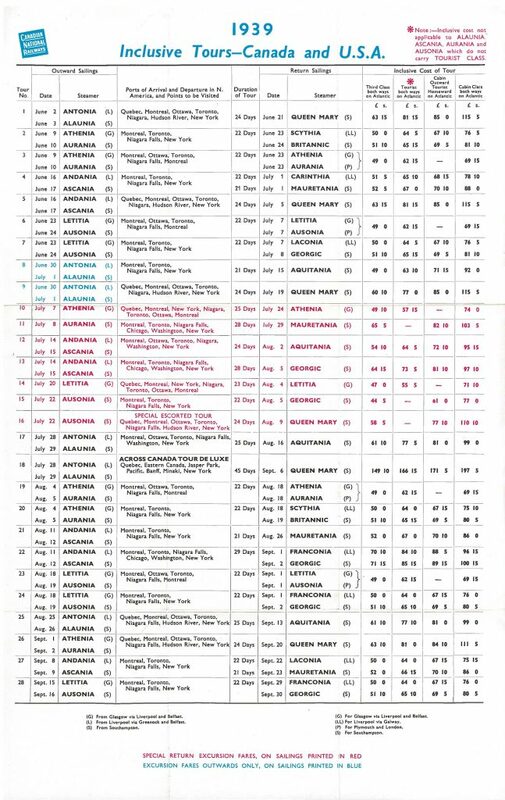 With the motto, the world its campus, a typical semester voyage would draw students from as many as 280 colleges and universities across the United States. 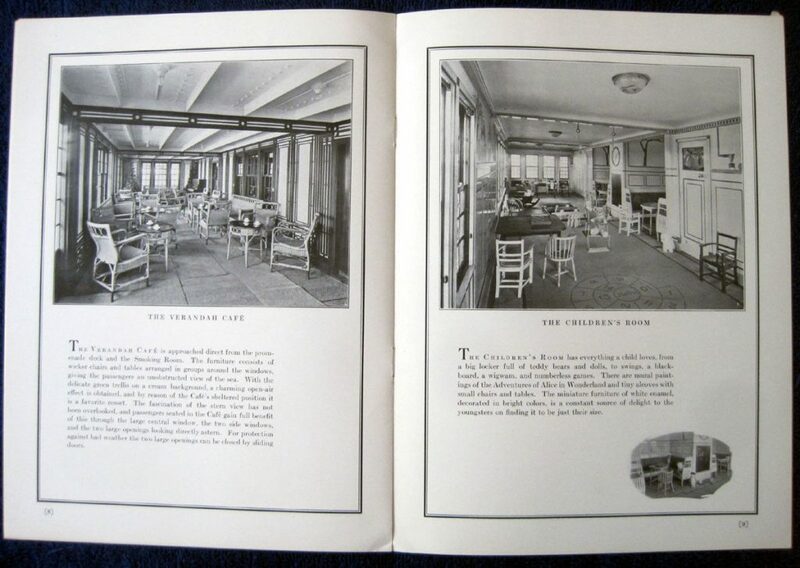 A rare Cunard Line information brochure from 1930, illustrating the Cabin Class accommodation of the A Class liners. 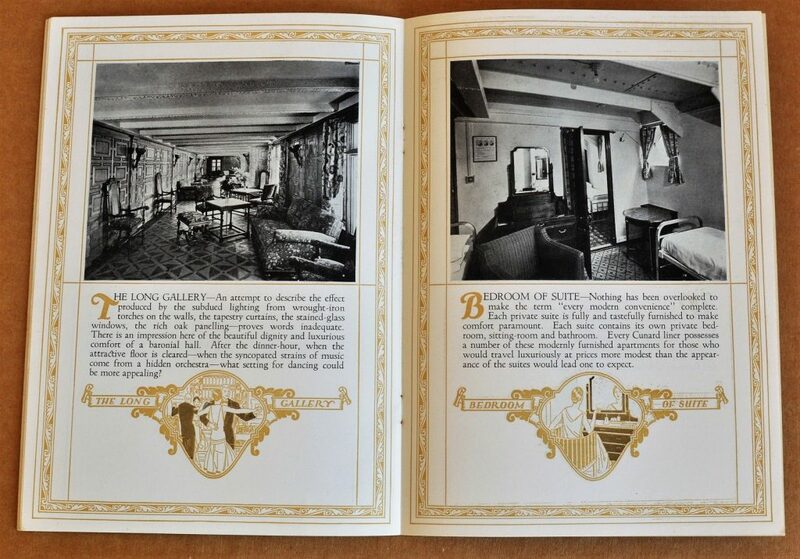 The six ships are described as having “the distinctiveness of glamorous English cottages, of charming Kentish rectories almost smothered in flowers”. 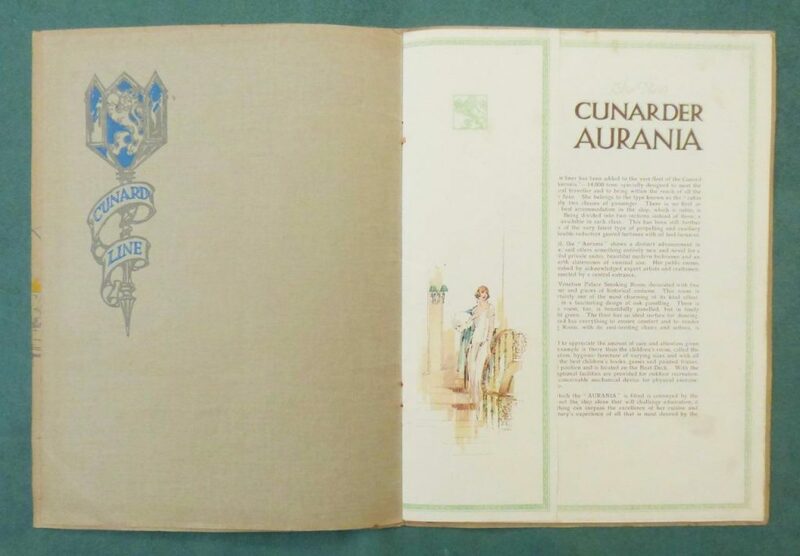 A rare Cunard Line information brochure published in December 1922 launching the new Cunarders, Andania, Antonia and Ausonia. 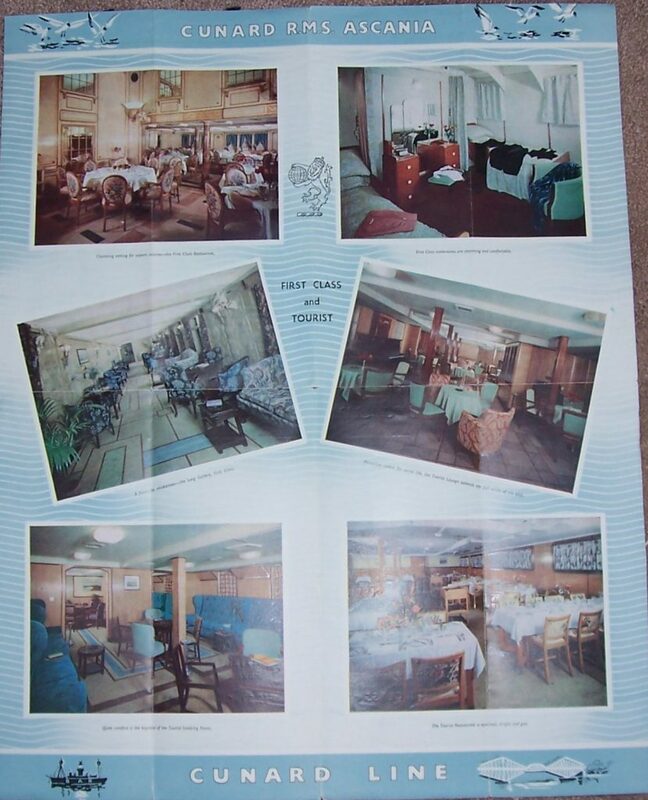 The ships are described as: “These large steamers carry Cabin and Third Class passengers only and are designed to meet the needs of those travellers who desire the highest degree of comfort at moderate rates. 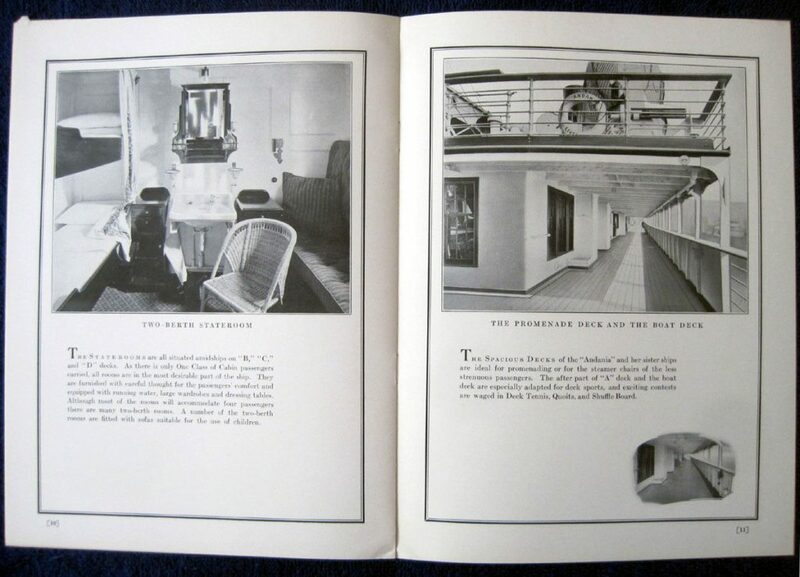 Their construction embodies the best of recent developments in engineering and naval architecture with the refinements of comfort and safety that are the fruits of the eighty two years’ experience of the Cunard Line”. 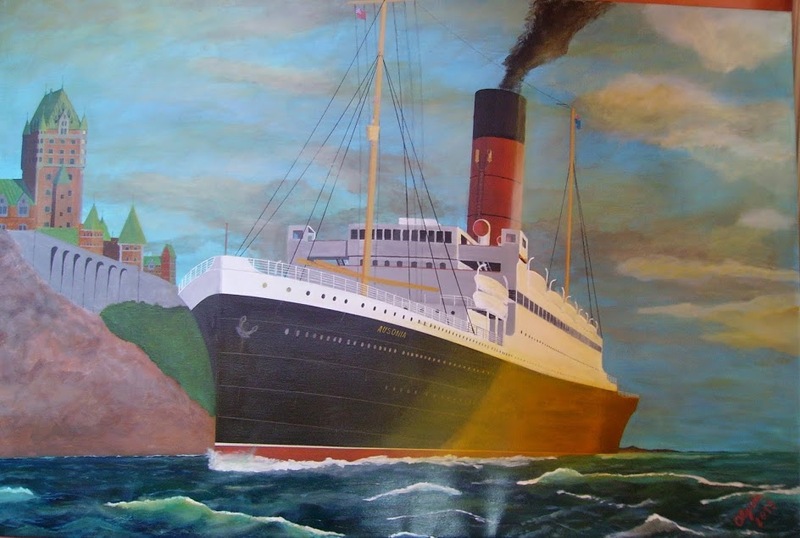 A painting by Laurent in oils and acrylics, representing RMS Ausonia leaving Quebec en route to Montreal. 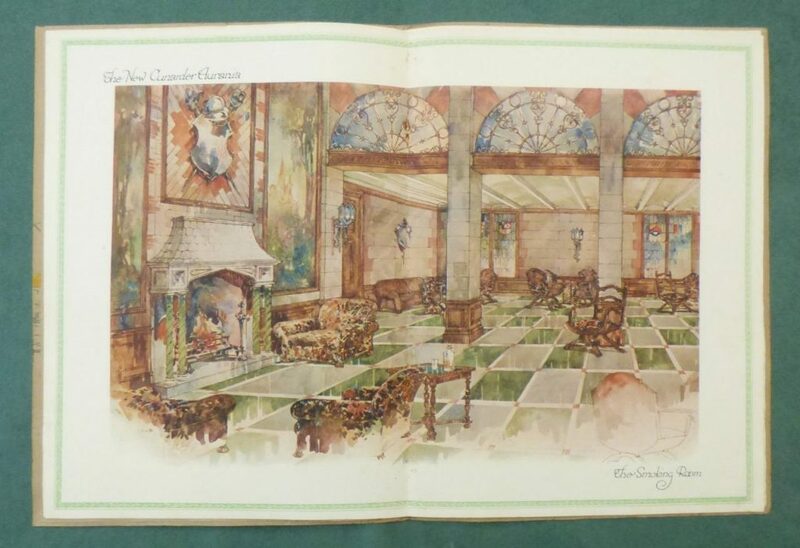 Based on an Odin Rosenvinge postcard reproduction, the painting shows the Castle Fronsac in the background. 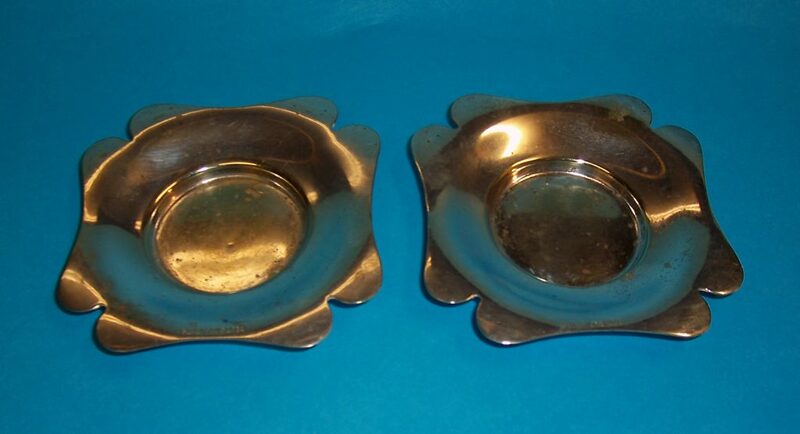 Dixie (Anne) Todd, who lives in Kent, Connecticut, USA, recently discovered these two Cunard RMS Ascania silver plated ashtrays in her attic. 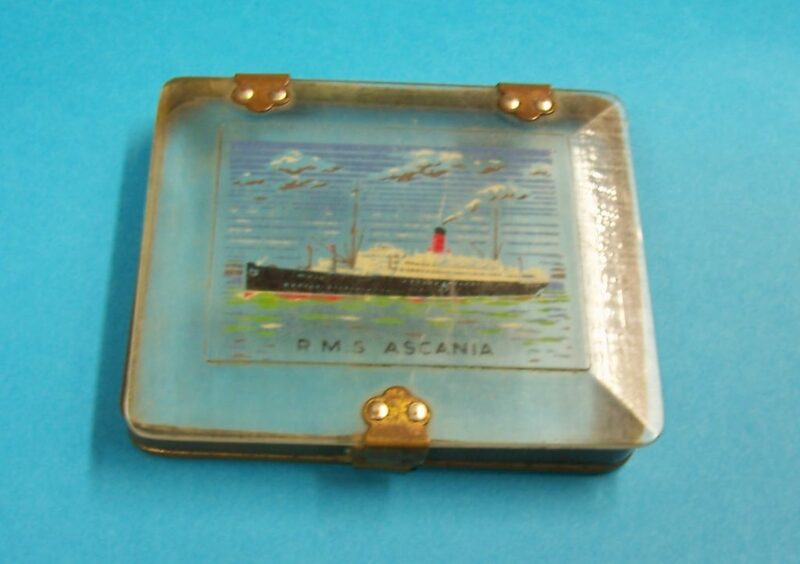 It is unclear if the ash trays were purchased on board RMS Ascania by Dixie’s Palm Beach grandfather, Guy Ferguson or obtained by her famous grandfather, Walter Gifford, who following a very distinguished career as president of AT&T, was appointed the United States ambassador to Great Britain from 1950 to 1953 and may well have travelled on RMS Ascania during this time, purchasing them as a memento or present for a loved one. 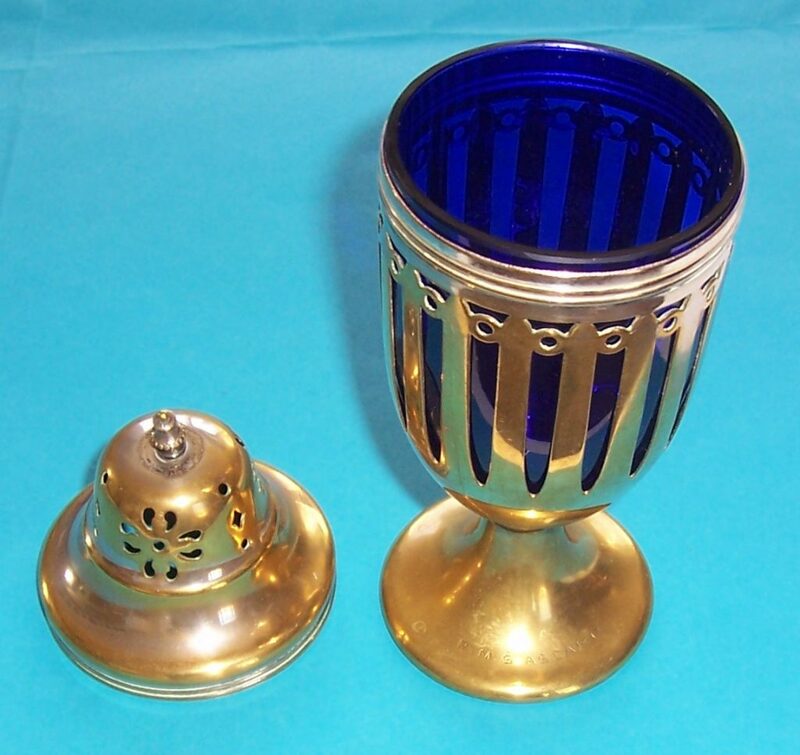 The ash trays have been very kindly given to me by Dixie and I am honoured be their new custodian. 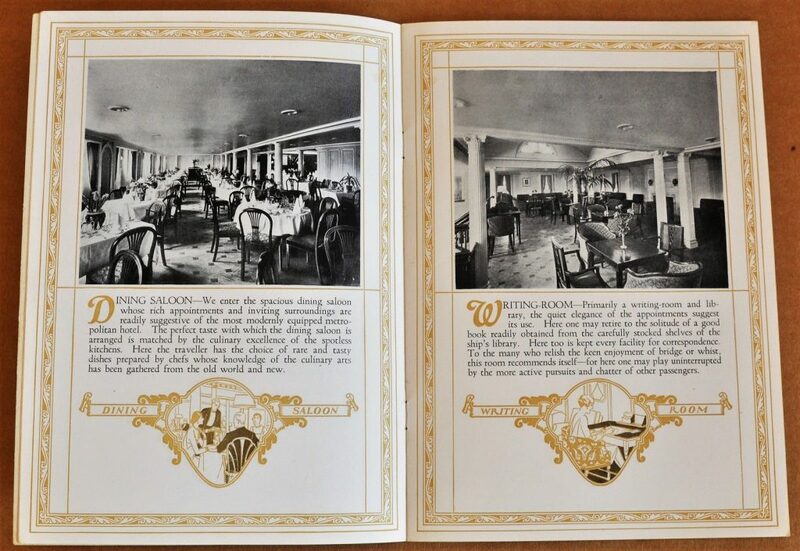 On the 14th January 1937, Captain Ralph Perry Fuller attended a birthday party on board the RMS Ausonia. 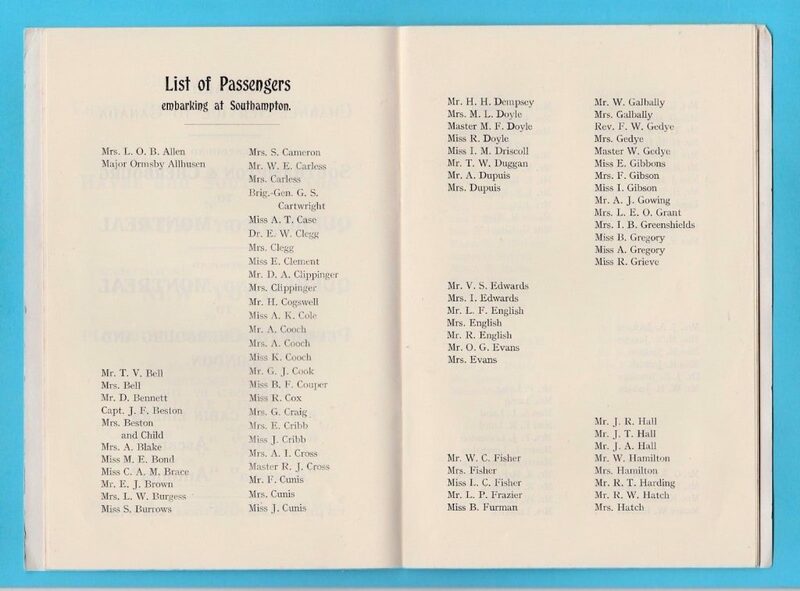 When he was 16 years old, Ralph Fuller signed up as a deck hand for the maiden voyage of the private yacht Aloha, owned by Arthur Curtis James. 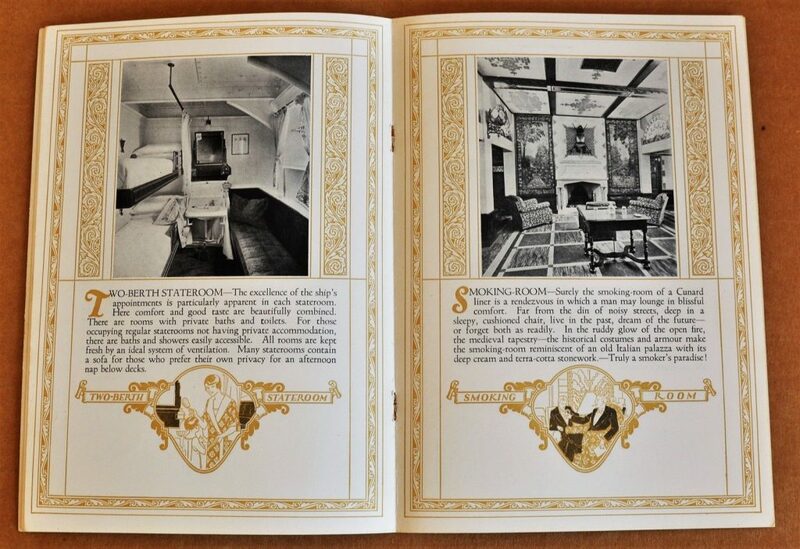 The voyage was from Nova Scotia to England and then onto Scotland. 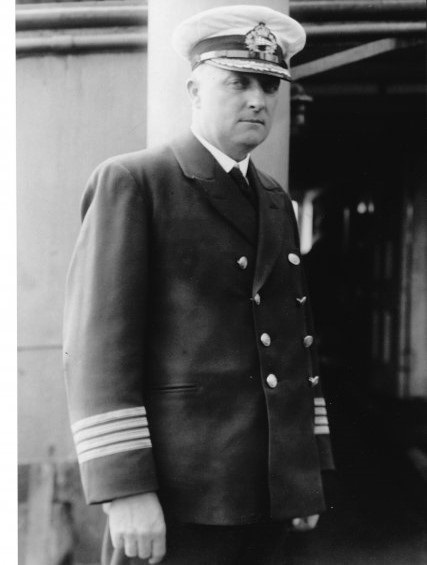 During the voyage Arthur James asked him what he wanted to do in life and Ralph told him that he wanted to become a ship’s captain and lucky for him, Arthur pointed him in the right direction, which paid his way to do what he dreamed of doing. 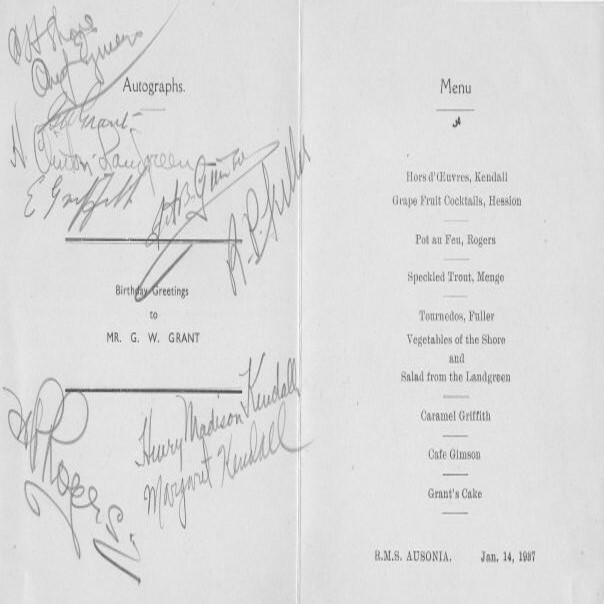 The menu for the 14th January 1937, signed by Captain Ralph Perry Fuller and all the other ships captains who attended the party. 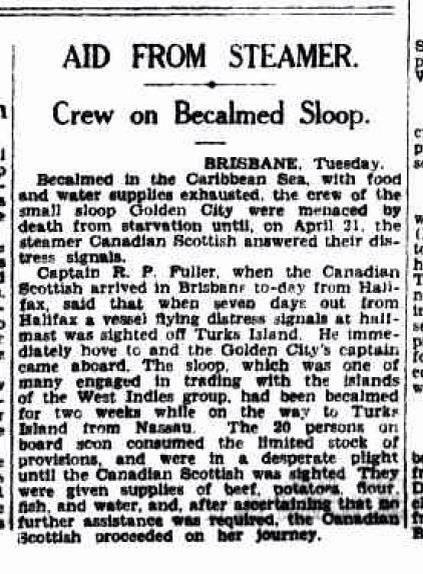 An interesting newspaper clipping from 1934 describing the rescue of the crew of the sloop, Golden City by Captain Ralph Fuller, who at the time was captain of the steamer, Canadian Scottish. 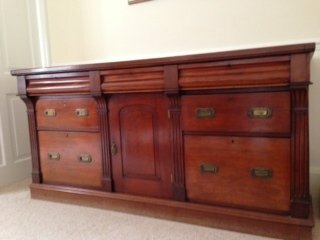 In February 2018 this Mahogany sideboard was put up for sale by Bond’s Nautical Antiques with an asking price of £2250. 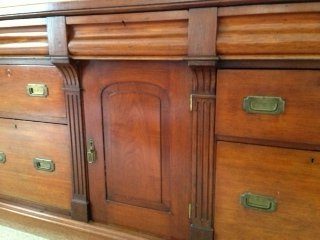 It is believed that the sideboard was removed from one of the Cabin Class cabins of RMS Alaunia in 1939 when the ship was requisitioned and converted into an armed merchant cruiser for the Royal Navy. 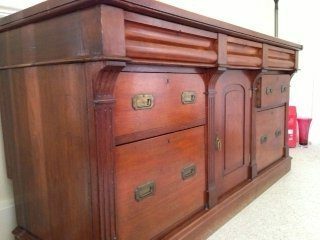 The sideboard is approximately 5 feet in length and is a beautiful piece of workmanship, with drawers to the top and the back shaped to sit in with the curve of the ship’s hull. 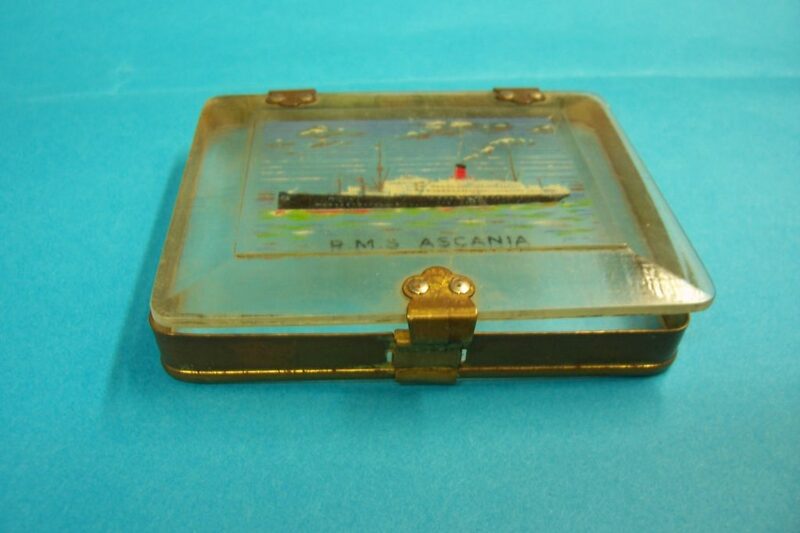 A rare Cunard RMS Ascania art deco Perspex cigarette box dating from the 1930’s with a painting of the ship on the lid.